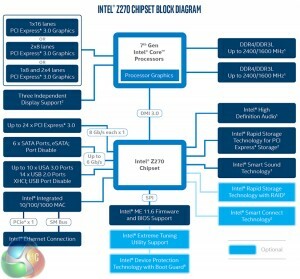 Today sees the launch of Intel’s new Z270 chipset and the Kaby Lake CPUs. 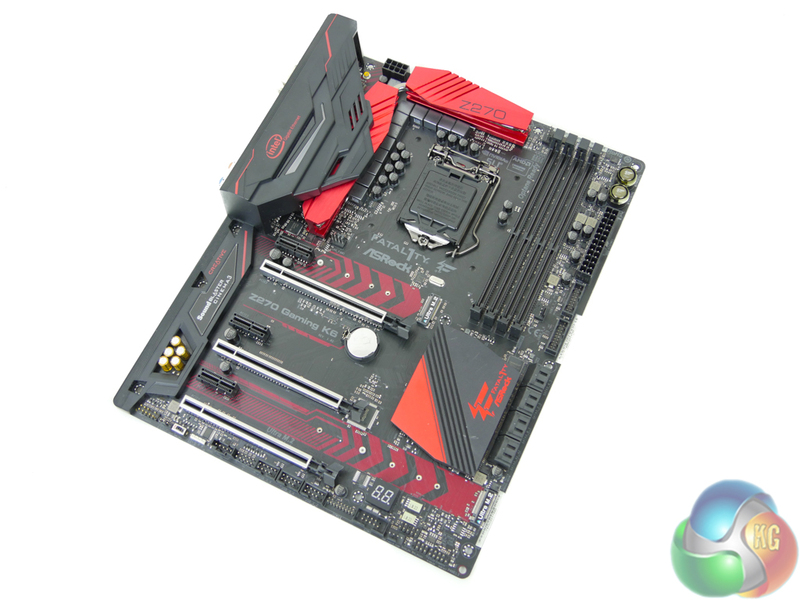 There’s no change to the LGA 1151 socket but the new chipset brings with it additional features that may tempt users into an upgrade over their ageing system. 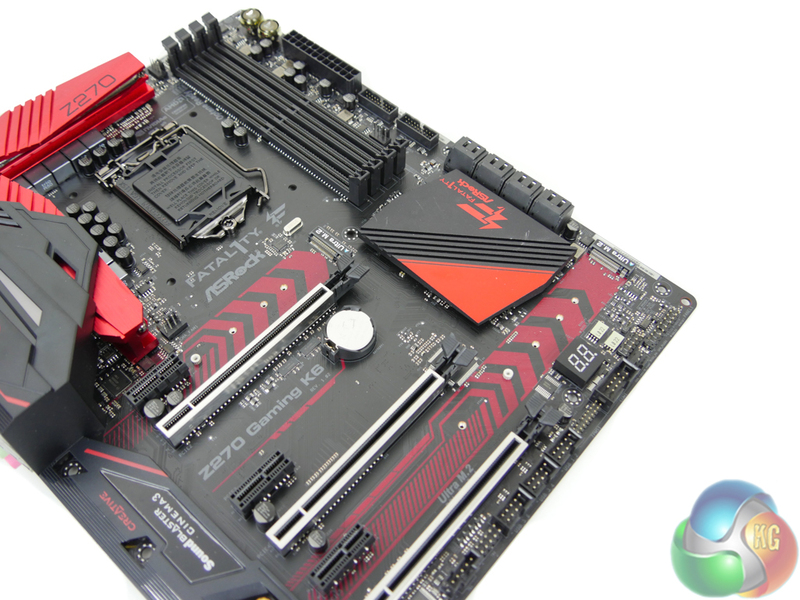 ASRock’s Fatal1ty Z270 Gaming K6 sits towards the upper end of the mid-range Z270 market section and aims to lure in buyers with additional features and the popular red and black colour scheme. 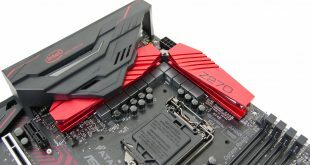 Leaning heavily upon the Z270 chipset’s wealth of features, ASRock’s Fatal1ty Z270 Gaming K6 offers up a pair of PCIe 3.0 x4 NVMe- and SATA-capable M.2 slots in addition to eight SATA 6Gbps ports and 10Gbps USB 3.1 Gen 2 Type-C and Type-A. Clearly high-speed storage is covered well and the same can be said for graphics card expansion with 2-card SLI and 3-card CrossFire capability. 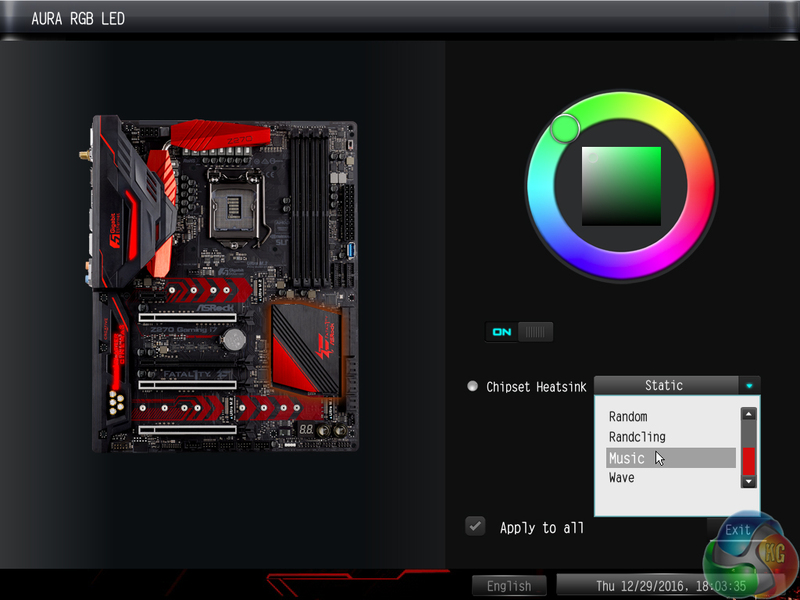 Leveraging the tried-and-tested red and black colour scheme, ASRock also adds RGB-ness into the Gaming K6 mix. Three individual locations are equipped with RGB LEDs and there’s also a 4-pin AURA RGB header that can power and control external strips from the likes of Cable Mod. Emphasising its position towards the upper-end of the mid-range market, a pumped-up audio solution based around Realtek’s ALC1220 audio codec is found in addition to dual GbE NICs from Intel. 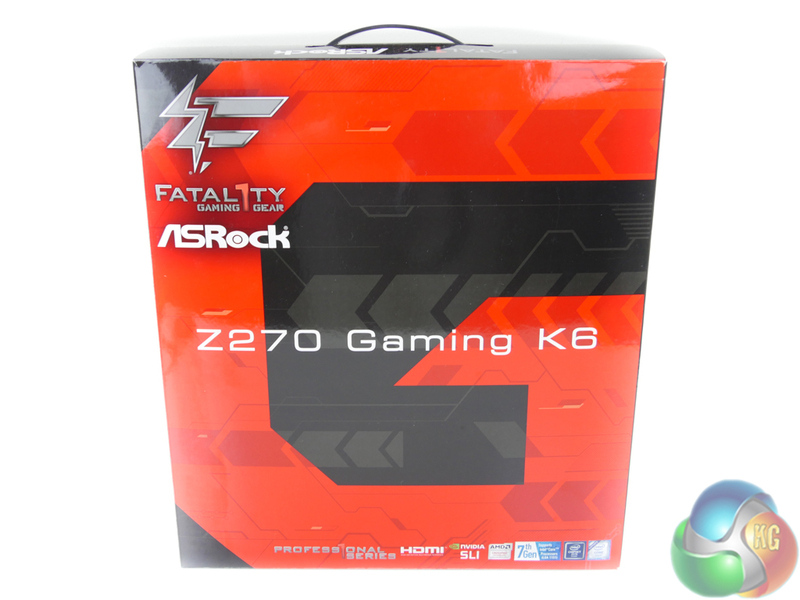 Many hardware and feature boxes have clearly been checked by the ASRock Fatal1ty Z270 Gaming K6. Can the board’s performance and software implementations prove that it’s a valid contender in a competitive market? 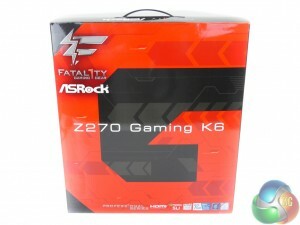 ASRock ships the Z270 Gaming K6 in packaging typical for the company’s Fatal1ty series of motherboards. Red and black colouring steals the show and a detailed infographic of specifications and features is found on the box’s rear side. 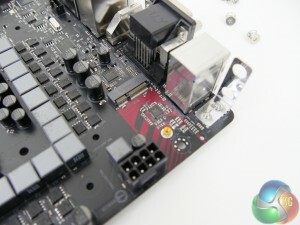 A basic bundle is formed of four SATA cables, two very small screws for each M.2 slot, a labelled rear IO shield, and a high-bandwidth rigid SLI bridge. The usual affair of documentation is supplied in addition to an ASRock Fatal1ty branded postcard. Who wouldn’t want a Fatal1ty postcard? ASRock uses the standard ATX form factor for the Fatal1ty Z270 Gaming K6. 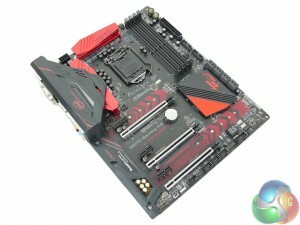 As far as layout decisions go, ASRock sticks to the standard ATX styling. Red touches contrast the motherboard’s largely black appearance. An all-black PCB is good to see on a motherboard of this calibre, rather than a washed-out brown alternative. Capacitors and other components also continue the black styling. 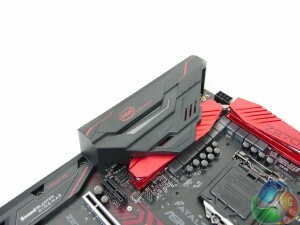 The VRM heatsink is a deep, shiny red colour which should look good inside a well-lit gaming system. 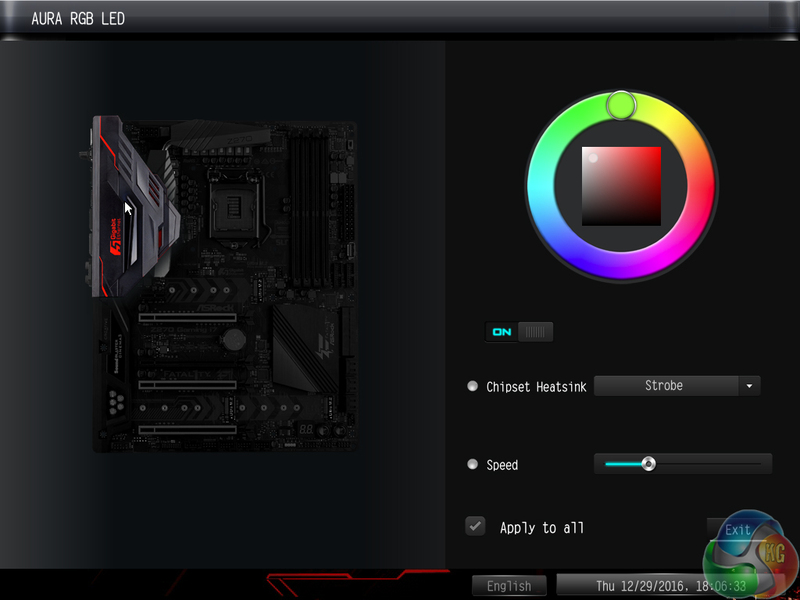 The Z270 Gaming K6 has three RGB LED locations; the rear IO cover, the audio section cover, and beneath the chipset heatsink. There is also a 4-pin AURA RGB header that can control external strips. Control of the RGB LEDs is limited but a number of lighting modes are supported and the three different sections (and LED strip) can be set with distinct individual preferences. I found the colour accuracy to be poor for the chipset LEDs and these were also very dim and barely visible. Four single-latch DIMM slots provide support for up to 64GB of dual-channel DDR4 memory using currently-available 16GB DIMMs. 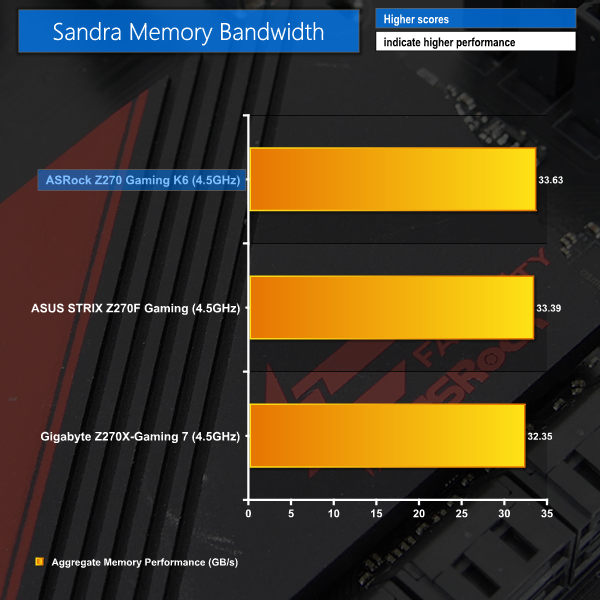 ASRock quotes memory frequency support of more than 3866MHz via overclocking. Frequencies this high are likely to rely upon a Kaby Lake CPU with a good IMC and a well-tuned BIOS profile devoid of memory-related bugs. 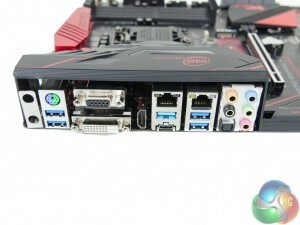 Dual internal USB 3.0 headers are provided using an ASMedia ASM1074 hub chipset and reside next to the 24-pin power connector. 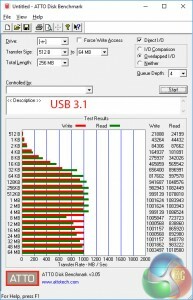 I like to see dual USB 3.0 headers as they provide additional flexibility to those who want more than two front panel USB 3.0 ports (which is particularly relevant with the rise in popularity of USB-powered VR headsets). 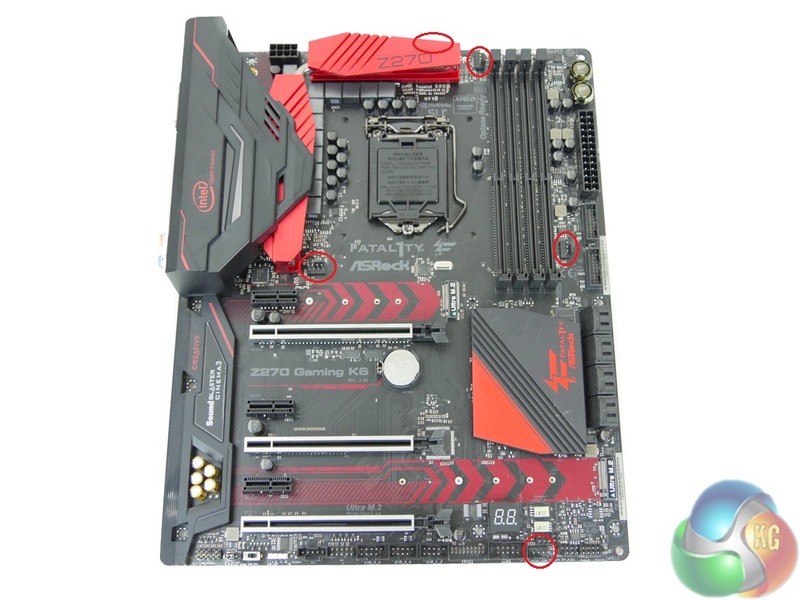 And their motherboard positioning is ideal as the 24-pin area is generally the quickest route front a case’s thick front panel cable. 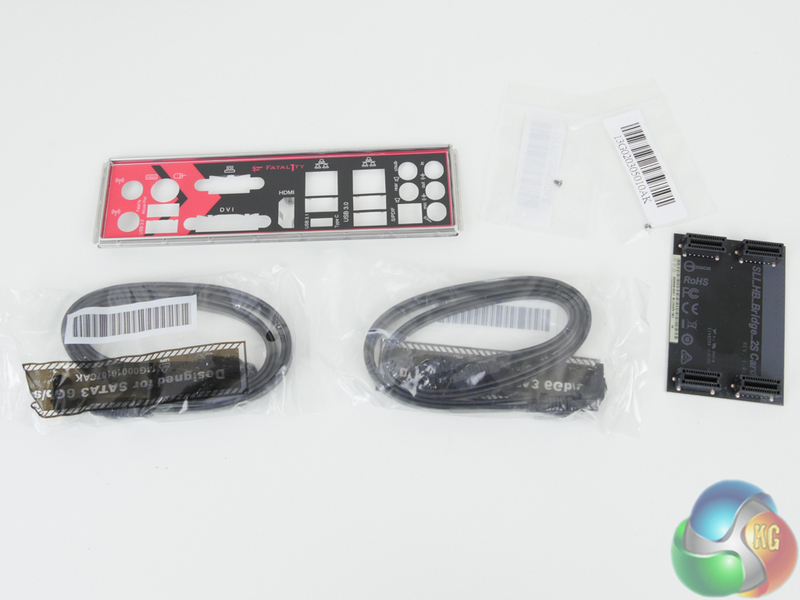 A single 4-pin fan header and power and reset onboard buttons are also located close the 24-pin area. Onboard buttons are ideal for out-of-chassis motherboard testing, be it for diagnostic or initial stability checking purposes. Despite using the new Z270 chipset, the LGA 1151 socket is the same as that found on 100-series chipset motherboards. This is how older Skylake CPUs are also supported by Z270 motherboards. An IDT 6V41642B clock generator manages the BCLK frequencies and waveforms. The well-cooled power delivery system consists of 12 primary phases for the CPU, iGPU, and miscellaneous system operations. Intersil’s ISL95856 hybrid-digital PWM controller is in charge of the power delivery system, aided by two ISL6625A dual MOSFET drivers. Sinopower SM4337 and SM4336 high- and low-side MOSFETs are used to shift power to the CPU and other rails. The 45A-rated inductors are marked ‘Trio R50’ and the capacitors are 12K-rated. Eight SATA 6Gbps ports are mounted in a right-angled orientation. 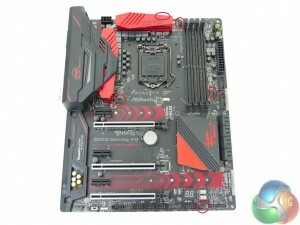 Six of the ports are provided through the Z270 chipset while the remaining pair comes from a slower ASMedia ASM1061 chipset and should be used after the Z270 connections have all been taken. 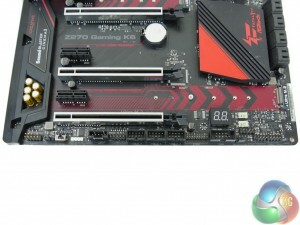 I like the inclusion of an additional SATA chipset as two pairs of Z270-powered SATA ports share their bandwidth with both of the M.2 connectors (depending upon the use of an M.2 PCIe or SATA device). There is no SATA-Express, which most people will probably see as a good move. But I don’t like the decision to omit it because its PCIe x2 bandwidth capability is ideal for powering front panel USB 3.1 Gen 2 devices. 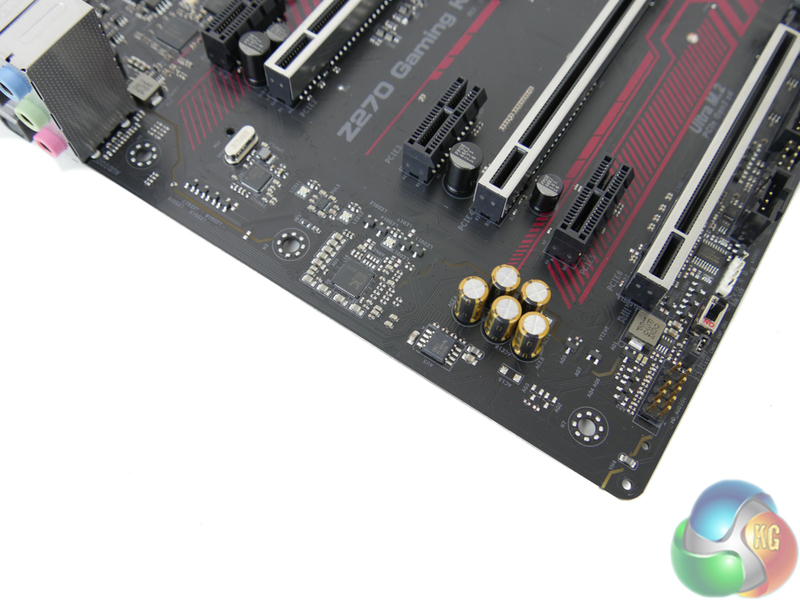 Until there is a valid internal USB 3.1 Gen 2 header, I believe that SATA-Express still deserves its place on motherboards. Both M.2 connectors support both SATA 6Gbps and PCIe 3.0 x4 32Gbps NVMe devices. The upper slot can handle devices up to 80mm in length while up to 110mm-long devices are supported in the lower slot. Intel Optane devices are supported as is RAID for dual M.2 PCIe SSDs being used simultaneously. 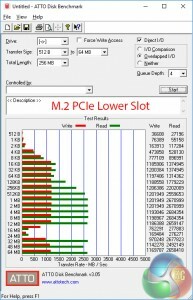 Using the M.2_1 slot renders SATA ports 0 and 1 unusable while the second M.2 slot will disable SATA ports 4 and 5 when in use. There’s no onboard U.2 port. I will not highlight this as a major negative, though, because U.2 devices are still scarce and positioning of the lower M.2 slot makes it ideal for use with an M.2-to-U.2 adapter card. Three full-length, steel-plated PCIe slots are used for high-bandwidth expansion devices such as graphics cards. Steel reinforcement is good for preventing PCB flex, slot breakages, and EMI. The uppermost slot is hard-wired for up to 16 PCIe 3.0 lanes from the CPU while the second one is hard-wired for up to eight lanes. Using both slots together gives PCIe 3.0 x8/x8 SLI or CrossFire with a single-slot cooling gap (assuming dual-width graphics coolers). That lowest full-length slot is wired for four PCIe 3.0 lanes. This makes it capable of housing a third graphics card for 3-card CrossFire but not for SLI due to the x8 link speed requirement. PCIe SSDs such as the Intel SSD 750 will also make sense to be housed in this lowest slot. With up to 24 chipset PCIe Gen 3 lanes, the Z270 chipset gives plenty of flexibility for add-in PCIe devices. A trio of open-ended PCIe 3.0 x1 lanes are ideal for installing add-in cards such as those for game capture or WiFi. Making the slots open-ended is a move that I like to see as it allows older PCIe x2, x4, x8, or x16 cards to be installed in the slot if a user decides that full bandwidth is not necessary. Example situations could be using an old PCIe x8 RAID card in HBA mode for connecting multiple HDDs or perhaps using a discrete PCIe x16 GPU simply for additional display outputs rather than bandwidth-intensive operations. A M.2 Key E slot hidden beneath the rear IO plastic cover is ideally situated for holding a WiFi card. One can hide a potentially ugly WiFi card and route the aerial cables with ease. The usual set of headers is located on the motherboard’s bottom edge. 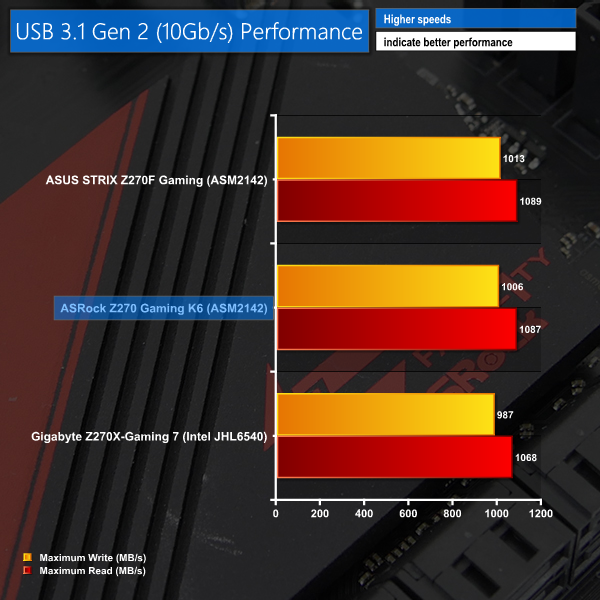 ASRock provides three USB 2.0 headers, which I have no complaints about given the number of hardware peripherals that use the headers (NZXT peripherals and Corsair AIO coolers, for example). 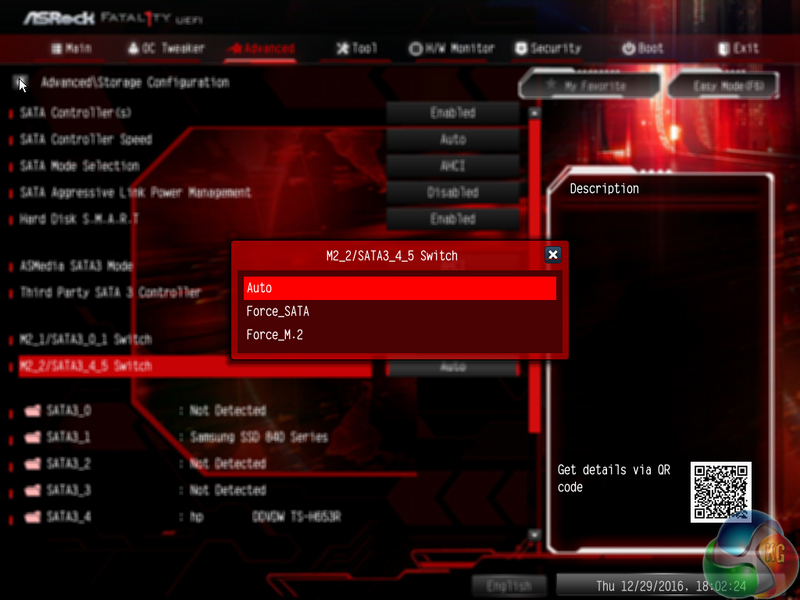 A physical XMP switch can be used for diagnostic purposes if the UEFI function is not working for any reason. Next to the switch is the clear CMOS jumper which is in a hard-to-access location. 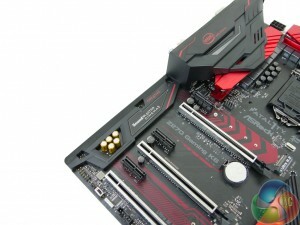 ASRock mounts an AURA RGB LED headers which uses +12V, G, R, B pins. The two-digit LED debug display is an inclusion that I love to see thanks to its worth when troubleshooting. Dual soldered BIOS chips give redundancy against a crash on the primary profile but the soldered mount requires a dedicated tool for chip replacement. Hidden beneath the RGB LED-equipped plastic shroud is the audio system. The 120dB-rated SNR Realtek ALC1220 codec is used at the heart of the audio system. A Texas Instruments NE5532 amplifier, aided by five 100 microFarad (10V) Nichicon Fine Gold capacitors, boosts the audio signal. 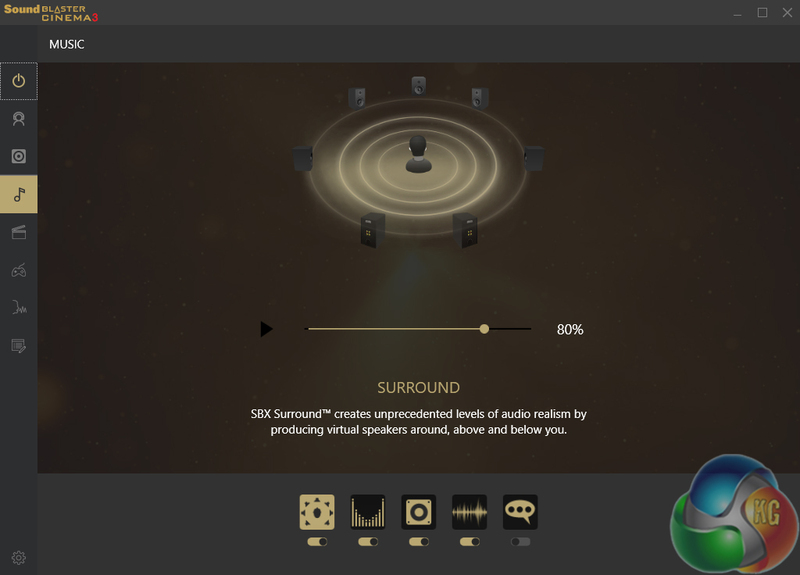 Creative Sound Blaster Cinema 3 software-based processing is supported. The Realtek ALC1220 codec does not use any direct shielding on the PCB but it does send signals along segregated tracks. 10Gbps USB 3.1 Gen 2 Type-A (light blue) and Type-C ports are powered by ASMedia’s new ASM2142 chipset and an ASM1543 for the Type-C logic. The ASM2142 is a two-lane PCIe chipset that can be fed by up to 16Gbps of total bandwidth when powered by PCIe 3.0 lanes from the Z270 chipset. Importantly, this allows a pair of connected USB 3.1 Gen 2 devices to operate at effectively full speed, rather than 8Gbps of total bandwidth between them, as was the case with the ASM1142 predecessor commonly used for Z170 and X99 motherboards. 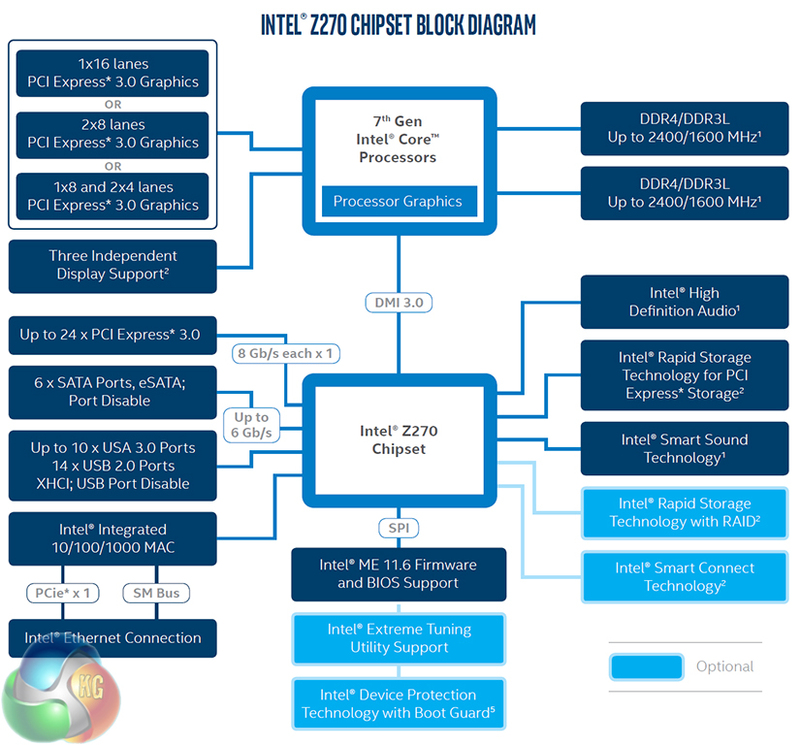 This helps to reduce the bandwidth and performance advantage that Intel’s USB 3.1 Gen 2 chipsets provided motherboards. Two pairs of chipset-fed 5Gbps USB 3.0 ports are found along with a PS/2 keyboard/mouse combo port. Single-link DVI-D, HDMI 1.4, and VGA (provided by Realtek RTD2168) video outputs are provided. 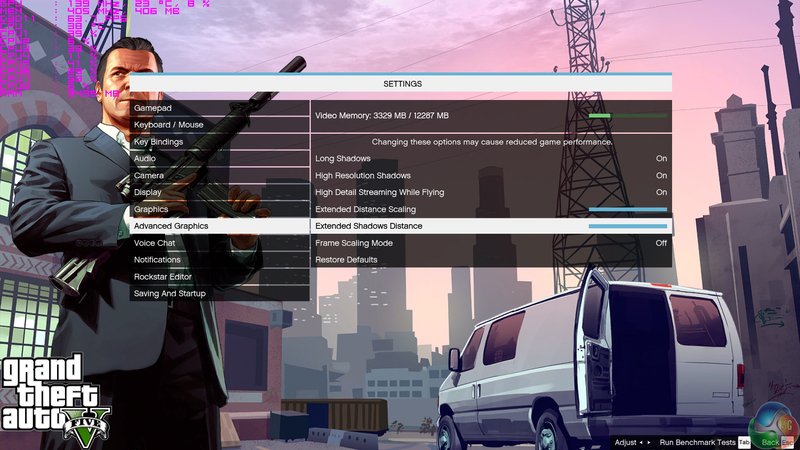 A triple monitor configuration is supported but the lack of dual-link DVI, HDMI 2.0, or (most importantly) DisplayPort is very disappointing and limits capability with higher-than-1080 resolution displays at 60Hz. Dual GbE NICs are provided by Intel I219V and I211AT chipsets which are capable of being teamed for a 2Gbps pipe. Disappointingly, teaming is not supported in Windows 10 due to an issue with the OS and Intel driver. 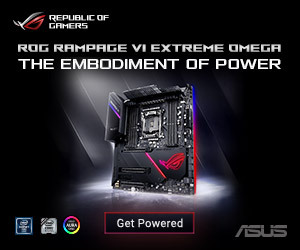 I am not impressed by ASRock’s rear IO decisions. 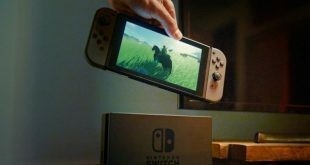 Although space is at a premium, additional USB ports and a DisplayPort connector are glaring omissions; 5 Type-A USB ports will be used quickly and no 4K60-capable display output is disappointing. 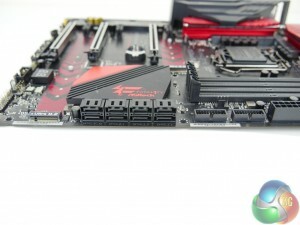 A total of five 4-pin fan headers are positioned around the motherboard. Two of these headers are given CPU duties, the second of which doubles as a water pump header that can run at a continuous 100% without PWM interference. Distribution of the remaining three 4-pin chassis fan headers is good; one is near the rear IO location, with the others residing along the board’s bottom edge and near the 24-pin. Nuvoton’s NCT6791D chipset manages fan control and system monitoring. 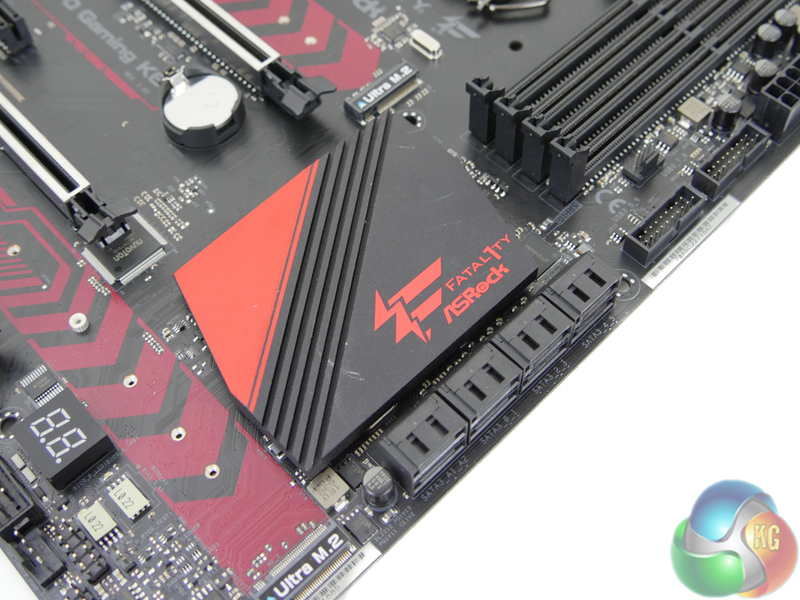 ASRock uses stylish but functional heatsinks for the VRM and chipset. 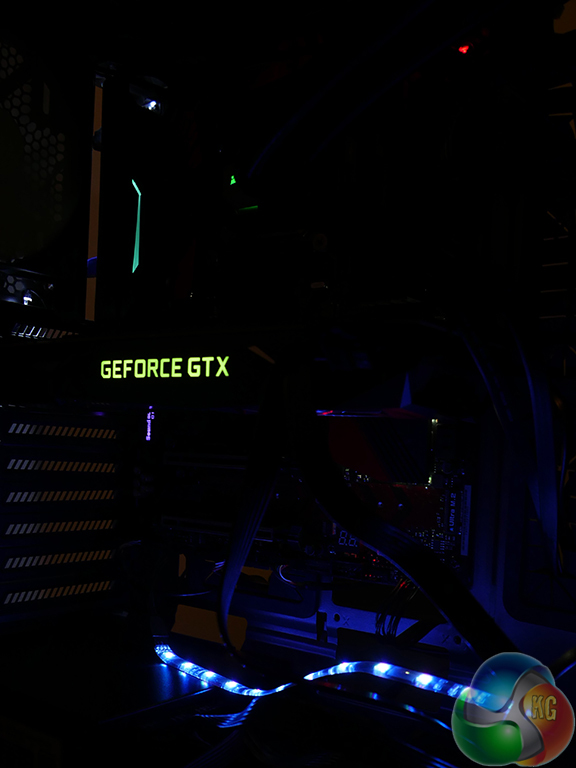 The plastic rear IO cover also houses an RGB LED that can be adjusted via the UEFI and OS software. 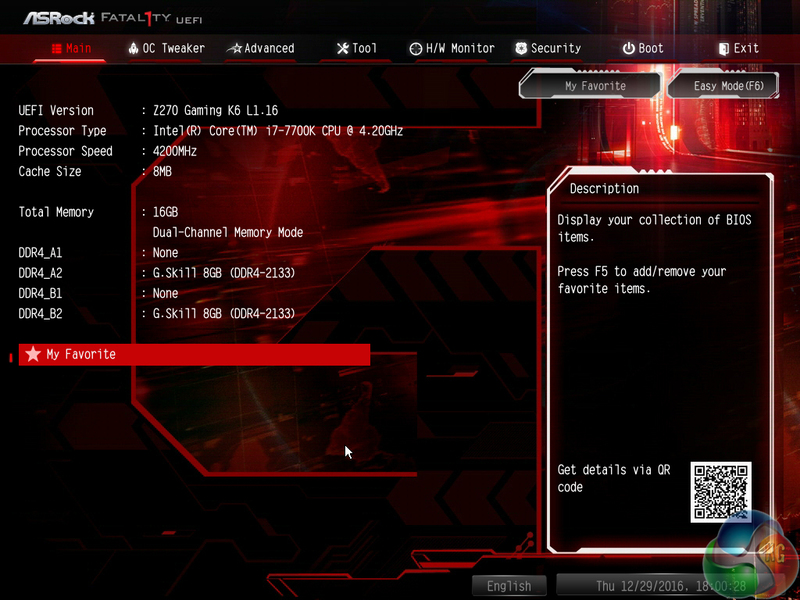 Firstly, we are pleased to report that our generic wireless mouse worked correctly in the ASRock Z270 UEFI. Some mice can be troubling with UEFI support, so when a generic wireless unit functions correctly in the interface, that is usually a good sign for overall mouse support. 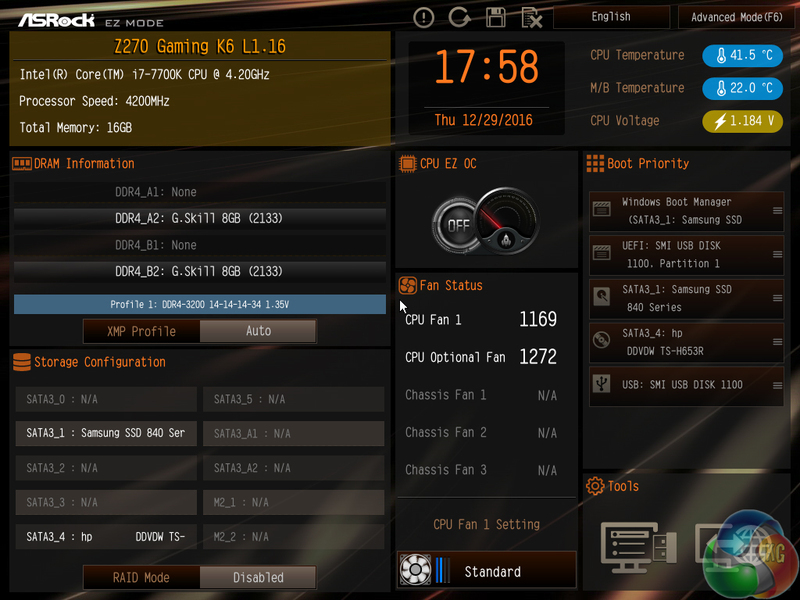 ASRock’s UEFI opens into the EZ Mode page which displays relevant information such as the fan speeds, boot device priority, and operating temperatures. 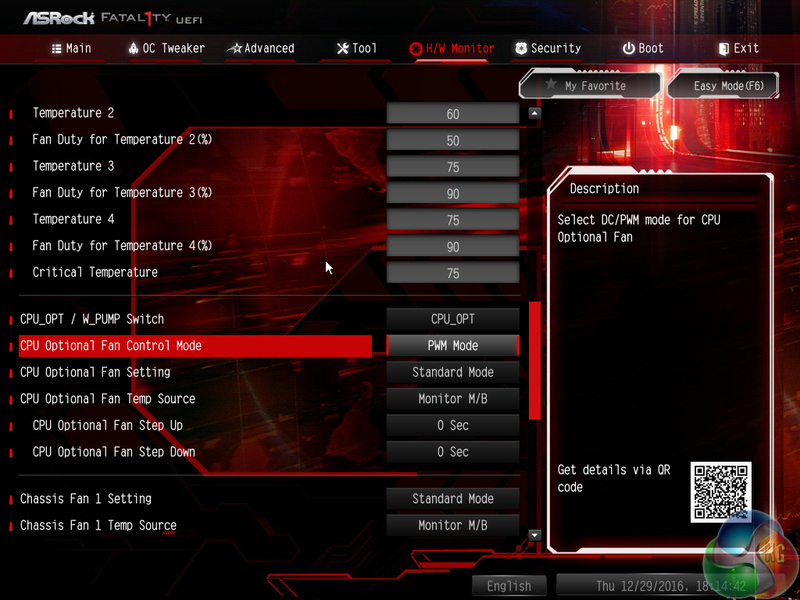 This section has limited ability but can be used to control XMP, use the CPU EZ OC feature, and change the fan speed setting. 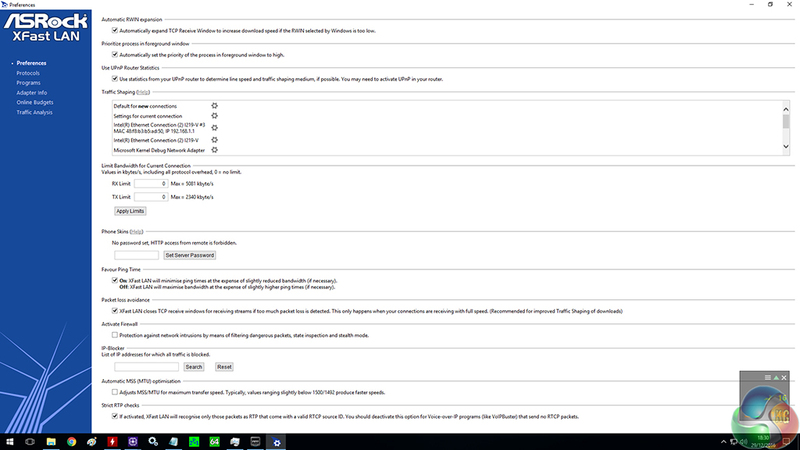 Pressing F6 takes you into the Advanced UEFI sections which is opened on the Main page (this can be changed). Pieces of information are displayed on this page but the quantity of content is slim. OC Tweaker is the section where the important overclocking parameters can be accessed. ASRock splits the subsections into CPU, DRAM, and Voltage configurations in order to segregate the vast amount of settings that can be changed. Up to five user user profiles can be saved to the board’s internal memory and these can be exported and imported via USB flash drive. 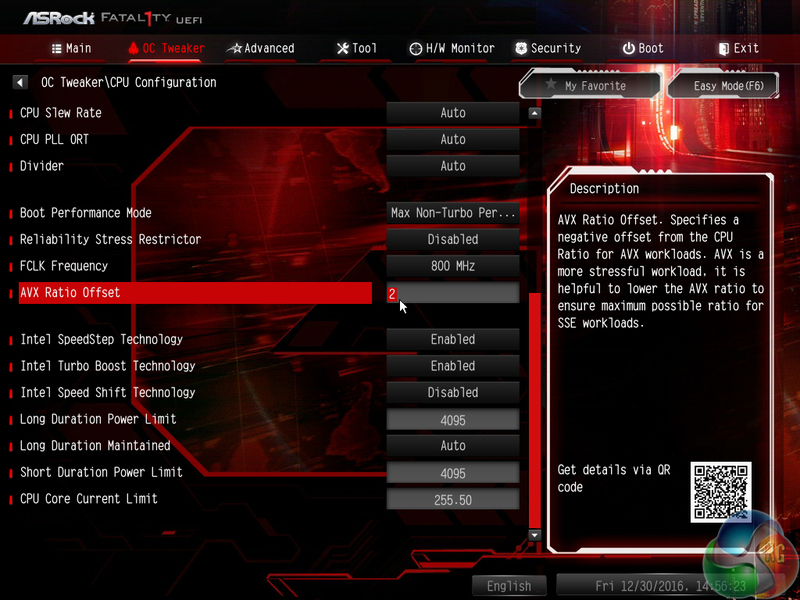 Five CPU overclocking presets are saved in the UEFI. These go from a 4.6GHz CPU frequency up to 5.0GHz in 100MHz intervals. Given that these presets are designed to work with a variety of CPUs, their voltage optimisation is limited and not specific to your chip (which may scale well or poorly with voltage and frequency). The 5.0GHz setting uses 1.45V CPU VCore with a -3x multiplier AVX workload compensation, which is too high for 24/7 usage without serious consideration for chip longevity. 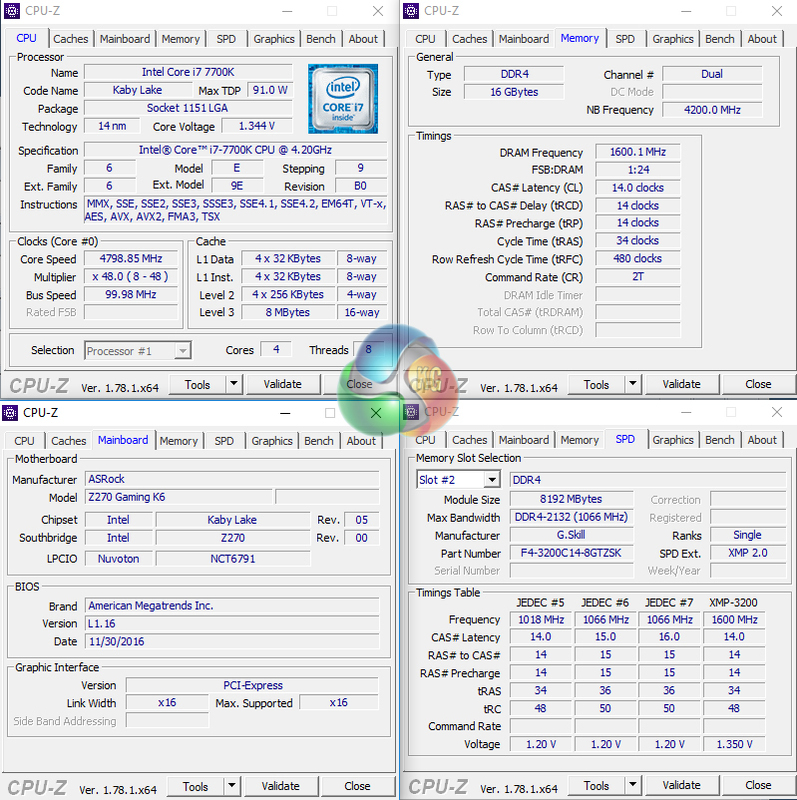 4.6GHz is comfortable with a 1.35V CPU VCore and no AVX offset. I liked the 4.8GHz mode which used a 1.380V CPU VCore but did have a -2x multiplier AVX offset. The fan speeds were setting to maximum under the 4.8GHz preset. Credit to ASRock for deploying a smart group of LLC settings with a clear, visual indication as to what each level means for voltage behaviour. 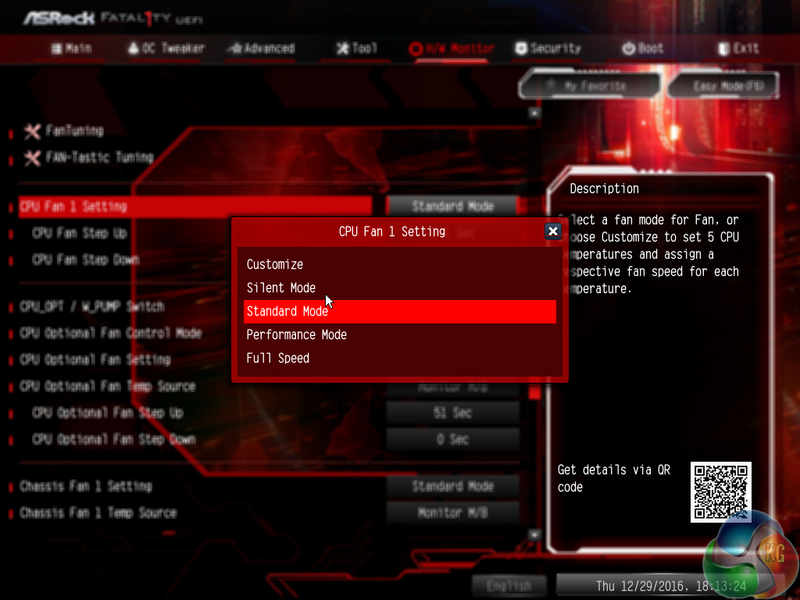 CPU and onboard features can be managed in the Advanced section. 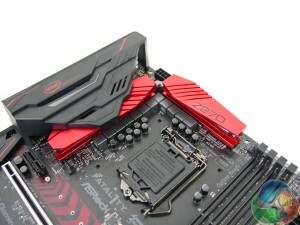 The M.2 slots can be set to force SATA mode or PCIe mode. ASRock’s Instant Flash tool can scan through folders in a storage device to search for a compatible BIOS profile. This makes BIOS updates a simple task. There’s also an option to update the BIOS via the internet. 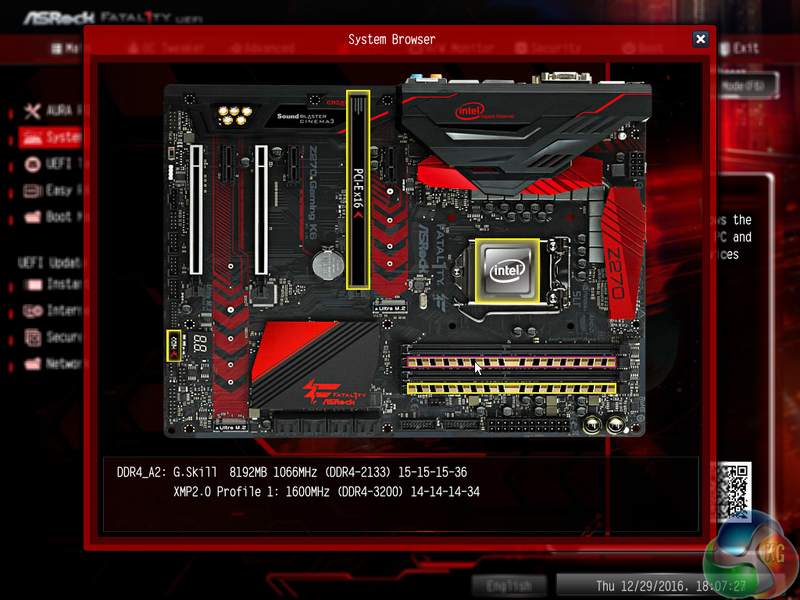 System Browser is a great tool that I continuously praise for its inclusion on ASRock (and MSI) motherboards. The visual outlook at the motherboard’s connected devices is ideal for troubleshooting purposes and for general system upkeep, such as checking that your SSDs are connected to the fastest SATA ports without opening your chassis or tracking multiple SATA cables. 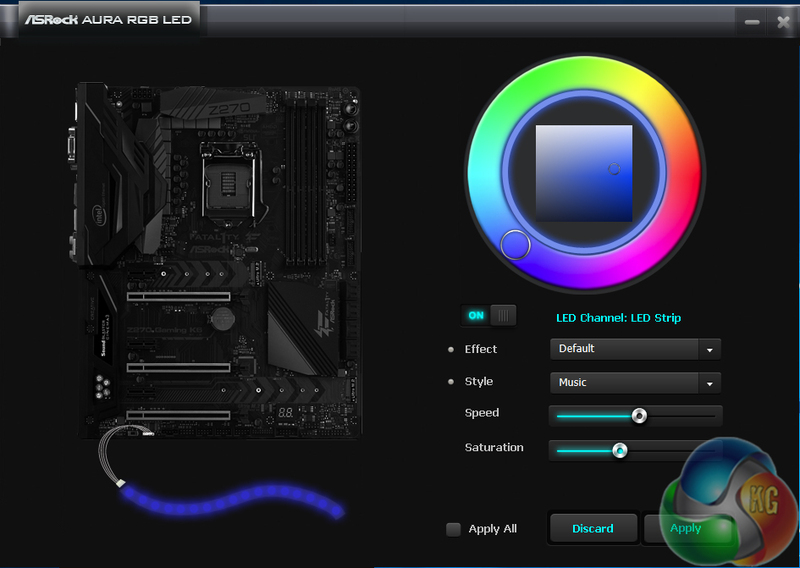 The UEFI-based AURA RGB LED tool allows the individual colour sections to be adjusted in terms of actual colour and LED activation mode. The tool is similar to the OS version, which is more of an indication of the simplicity of the latter rather than the complexity of the former. 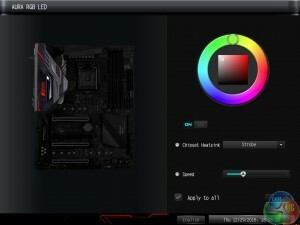 There is no ability to control RGB LEDs on connected devices such as graphics cards. 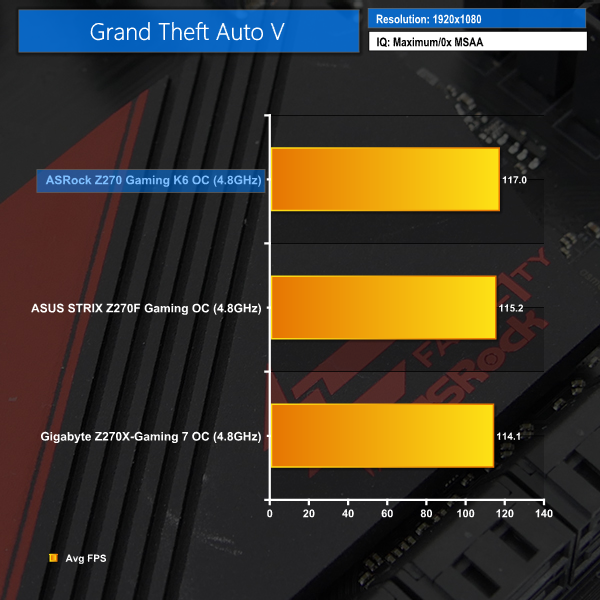 This is likely due to ASRock not having a position in the VGA card market, as many of its motherboard vendor competitors do. The initial H/W Monitor sections outlines system operating parameters such as voltages, temperatures, and fan speeds. 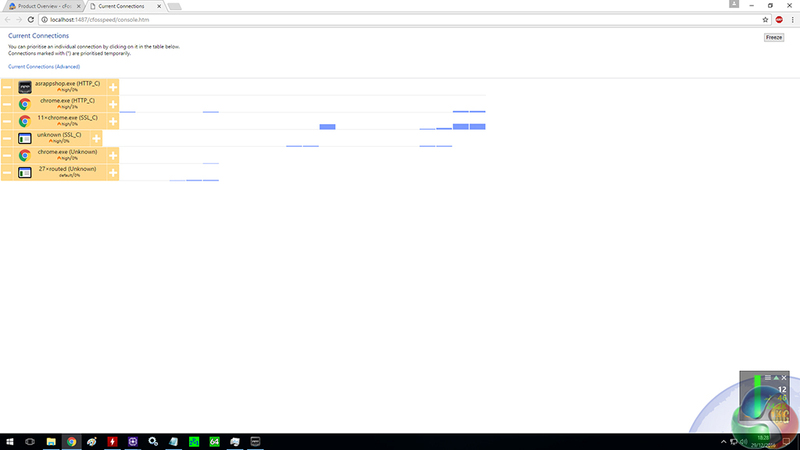 Scrolling down takes a user to the comprehensive fan control section. 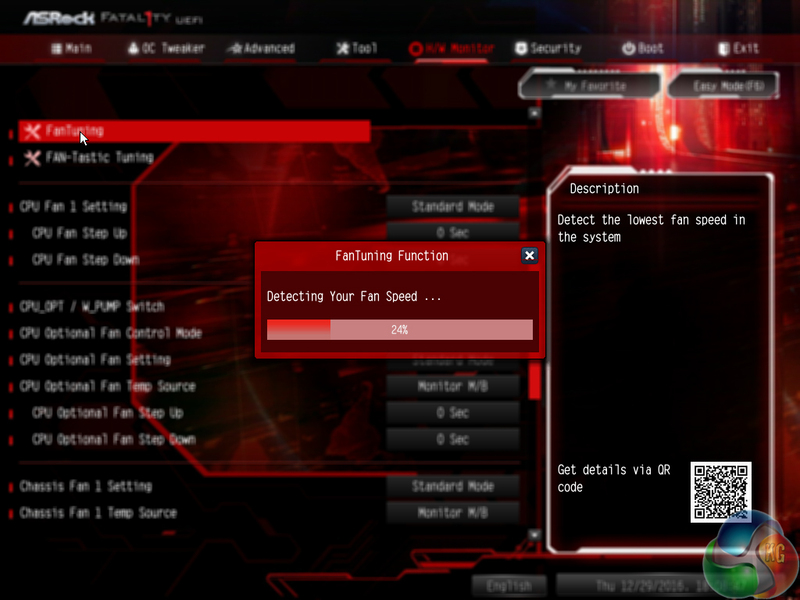 ASRock provides an automated fan tuning tool that scans your system’s fans for their lowest rated speed (in order to keep noise levels low). 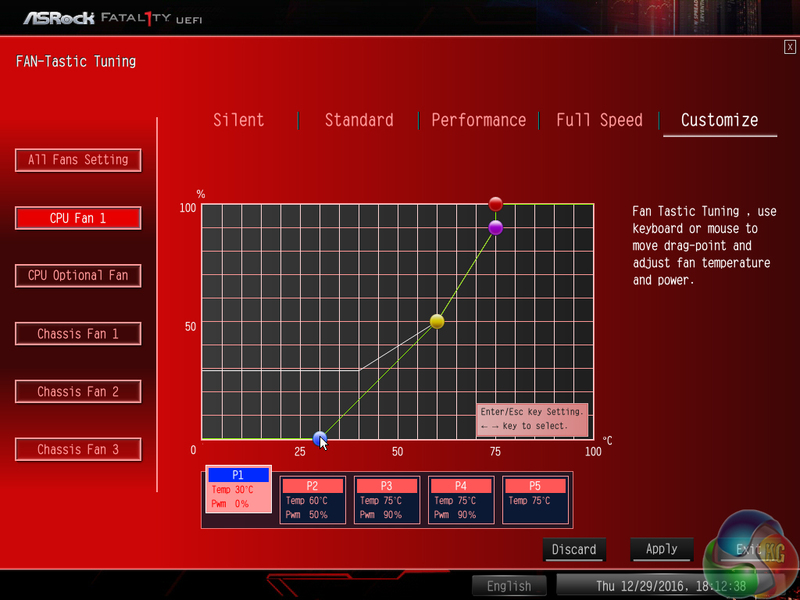 FAN-Tasting Tuning is, despite its silly name, a good tool for adjusting fan speed curves in a manual fashion. The fan speed can be set to 0% at as low as 30°C, which is good to see as some competing vendors do not allow the 0% operation that certain fan models support. If you prefer to tune your fan speed outside of the graphical environment, ASRock also gives a good set of pre-determined speed profiles. There’s also the ability to manually adjust the fan speed curve using numeric temperature and fan speed percentage values. 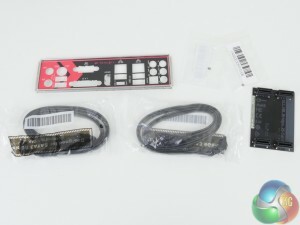 DC and PWM control modes are supported for the two CPU fan headers and the CHA_Fan3/Water Pump header but not for the chassis fan 1 and 2 connections. 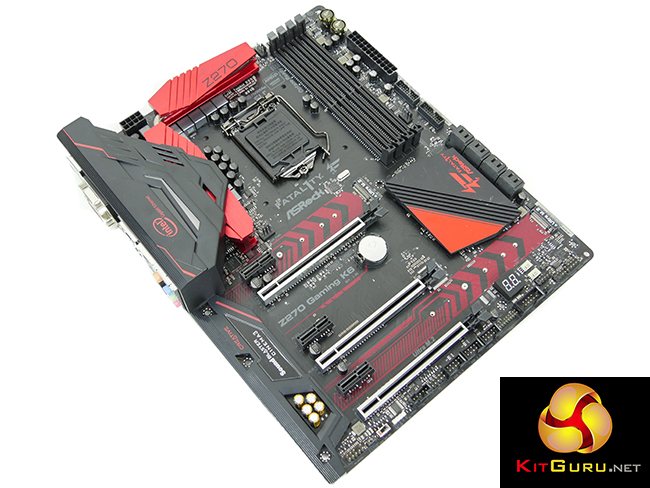 ASRock Z270 UEFI is a good solution with a number of useful features. 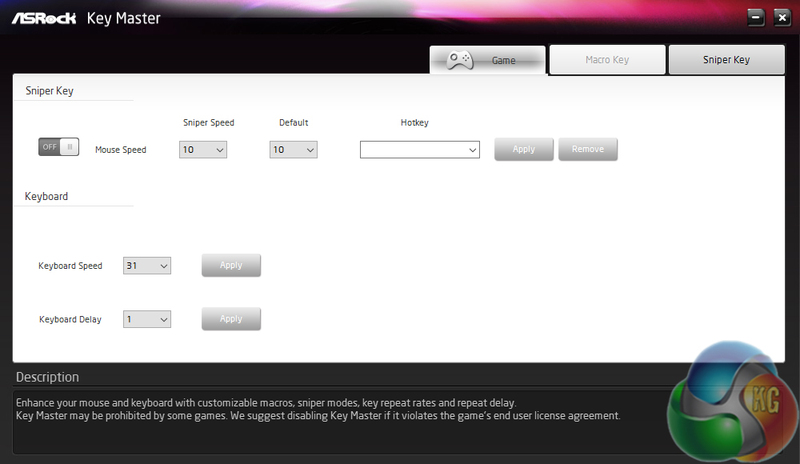 The System Browser tool is convenient, Instant Flash works well, and fan control options are very good. However, the overclocking presets are not great as the voltages are on the high side and there’s no clear tuning wizard that is specific for one’s own chip. If you are a user who will ignore the automated overclocking functions and appreciate precise fan control, ASRock Z270 UEFI should have you impressed. 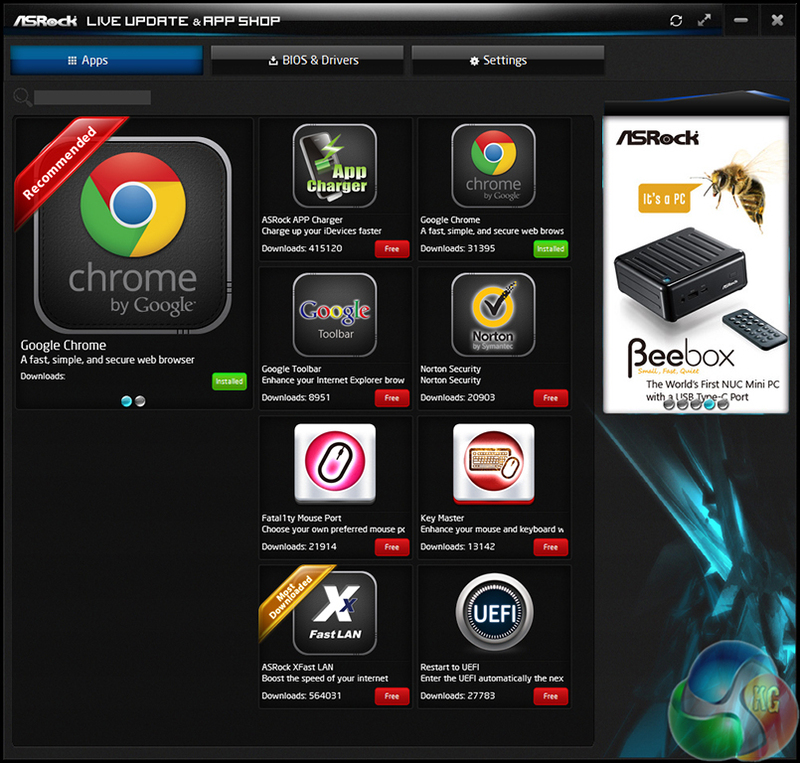 Software tools are generally delivered through ASRock’s APP SHOP. We take a look at some of the more useful software tools provided. We must note that the driver CD supplied with our motherboard sample did not feature an installation for ASRock’s F-Stream software. It is highly likely that this useful utility will be available to download upon launch. Aside from being used as a repository for software apps, APP SHOP can also be used to outline and install BIOS and driver updates. XFast LAN is based on cFos software and gives a good degree of network monitoring ability. There are also options to control network parameters but most of these are more effectively managed through one’s wireless router in order to provide control for the entire network, not just a single computer. 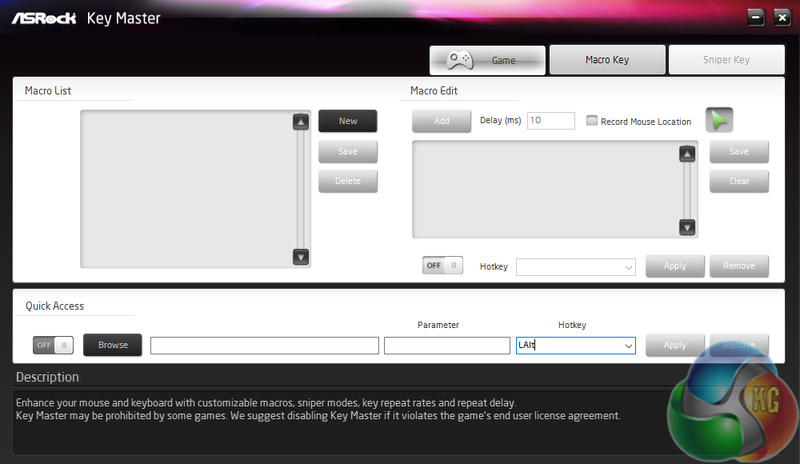 Key Master is a good way of creating macros if your keyboard does not include any or feature a macro manager tool in its software. 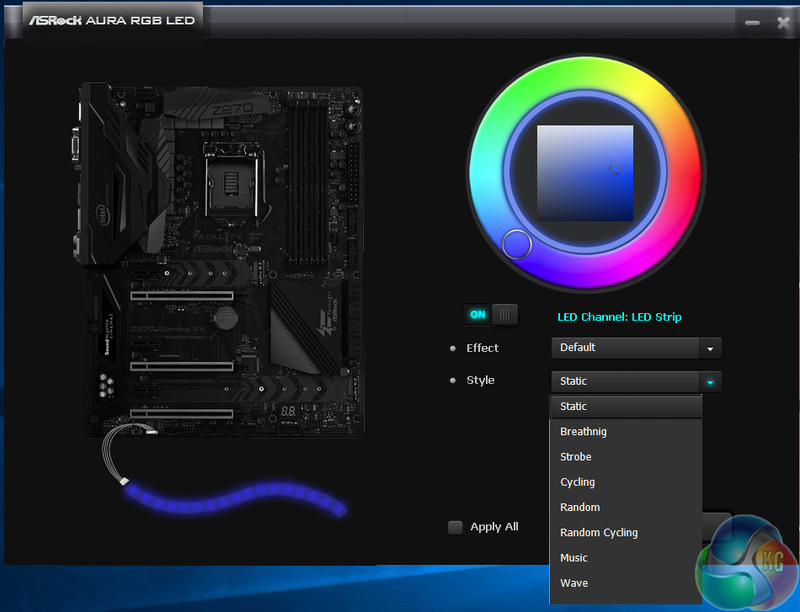 There’s not much difference between the OS and UEFI AURA RGB LED tools, which speaks volumes for how basic the OS option is. A number of control methods are supported and different colours can be set for the four individual zones. That’s about it for RGB LED control. 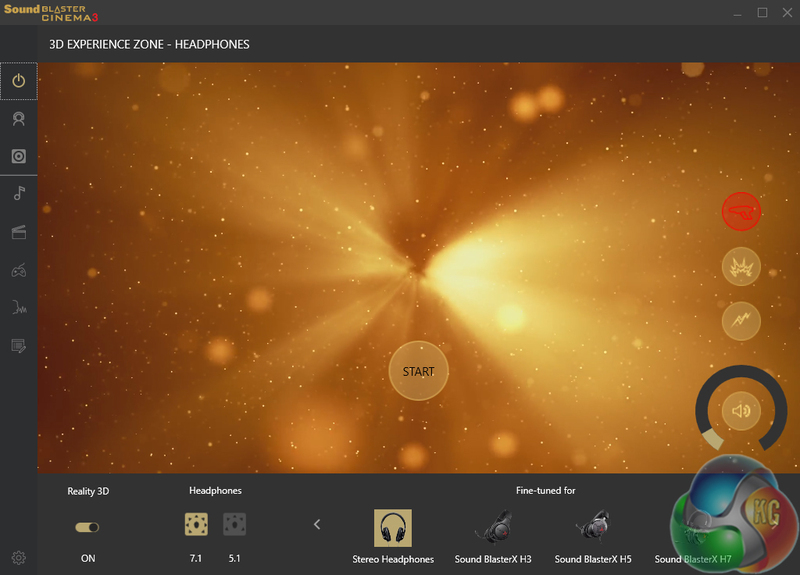 Sound Blaster Cinema 3 software can be used to control the audio system and tweak profiles to your individual preference. ASRock’s offering of OS software is certainly basic. It may be due to the pre-release nature of our testing, but it is disappointing to see such a small variety of software apps. The good thing is that this is easy to change as ASRock can roll out new apps following the motherboard’s release. 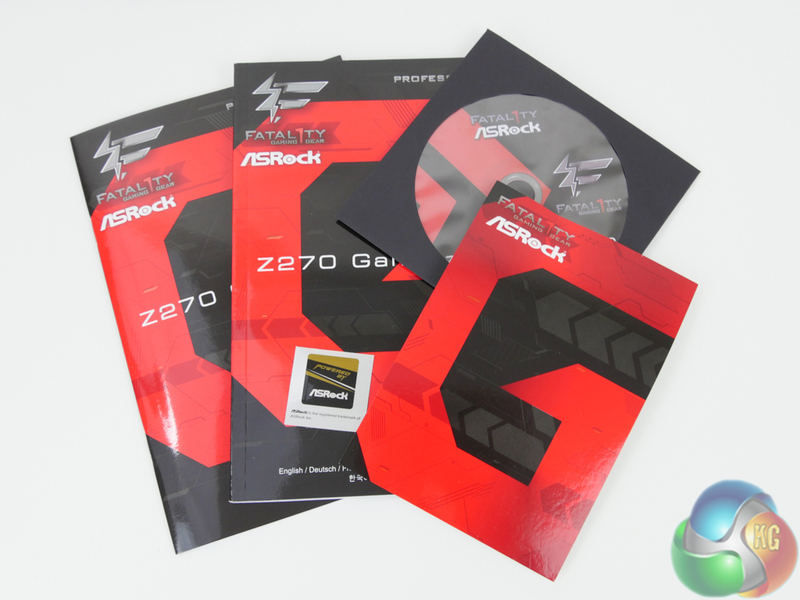 We will be outlining the ASRock Fatal1ty Z270 Gaming K6 motherboard’s performance with the Core i7 7700K CPU and 16GB of 3200MHz G.Skill TridentZ DDR4 memory. 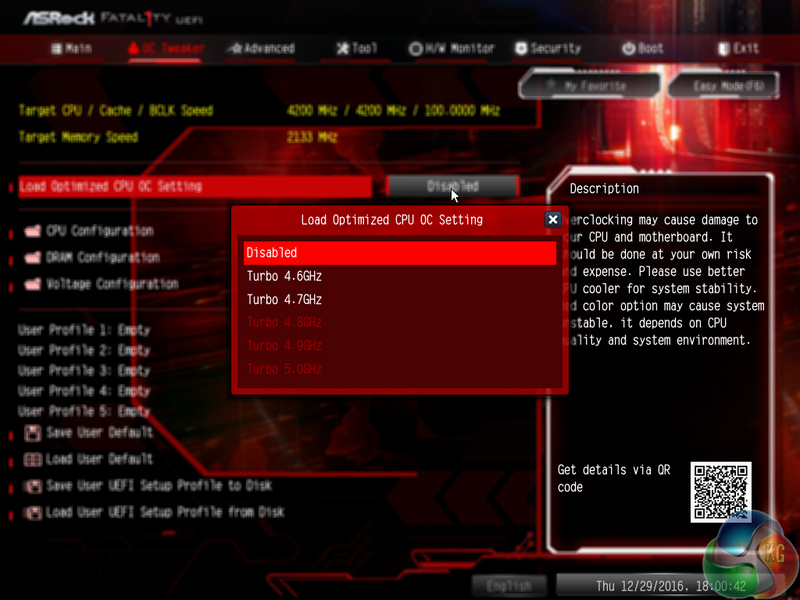 By default, the ASRock Fatal1ty Z270 Gaming K6 motherboard applies a multi-core turbo (MCT) state and forces the 7700K to a constant 4.5GHz when XMP is enabled. 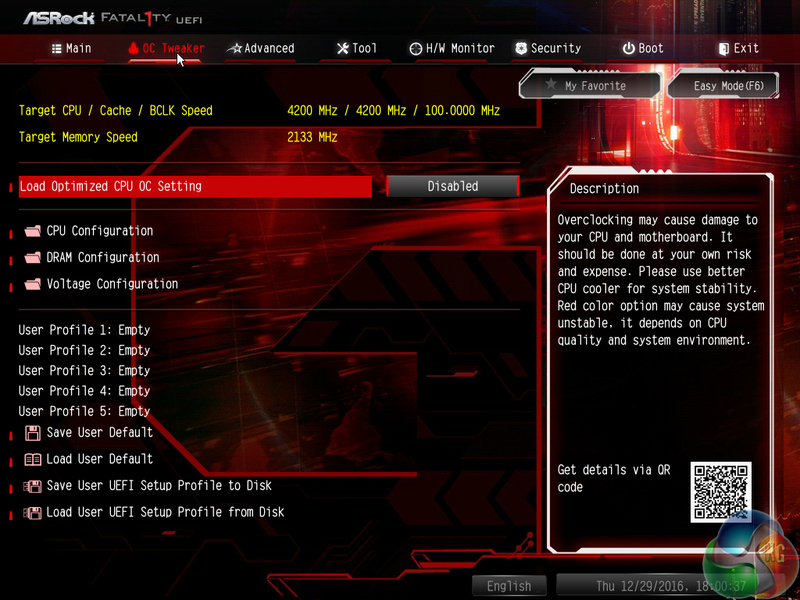 Overclocked performance will be outlined later in the review. 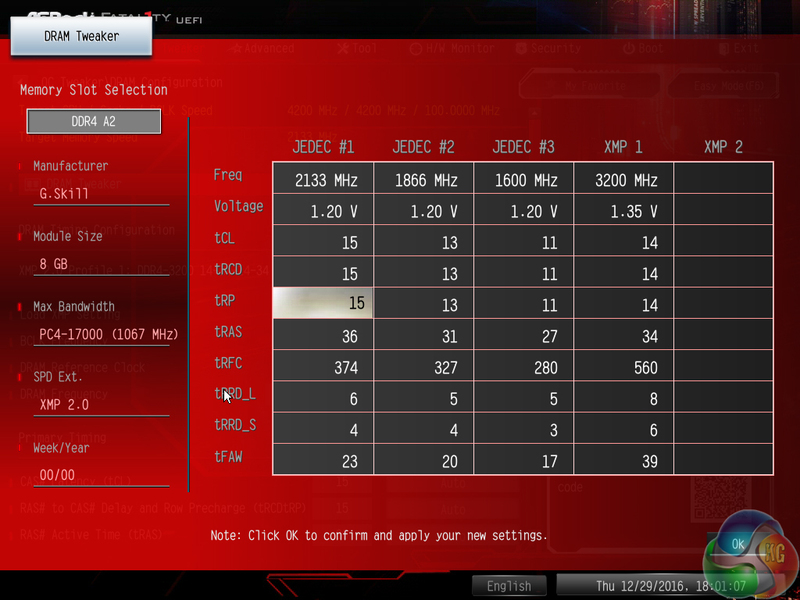 Stock MCT voltage for the ASRock board was 1.232V under Prime 95 load. This is a good level which results in manageable thermals for even mid-range air CPU coolers. 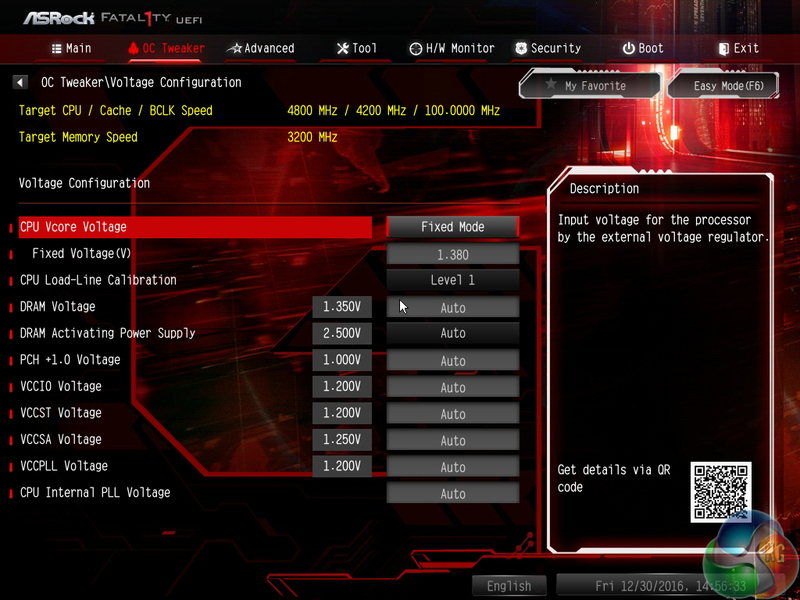 And 1.232V shouldn’t be a concern for CPU longevity. The voltage drops below 0.9V under idle and low-load conditions. 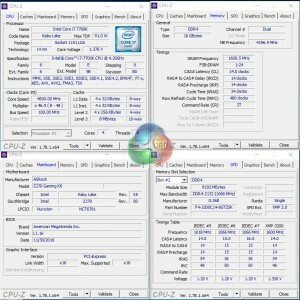 Processor: Intel Core i7 7700K (4.5GHz Forced Turbo). 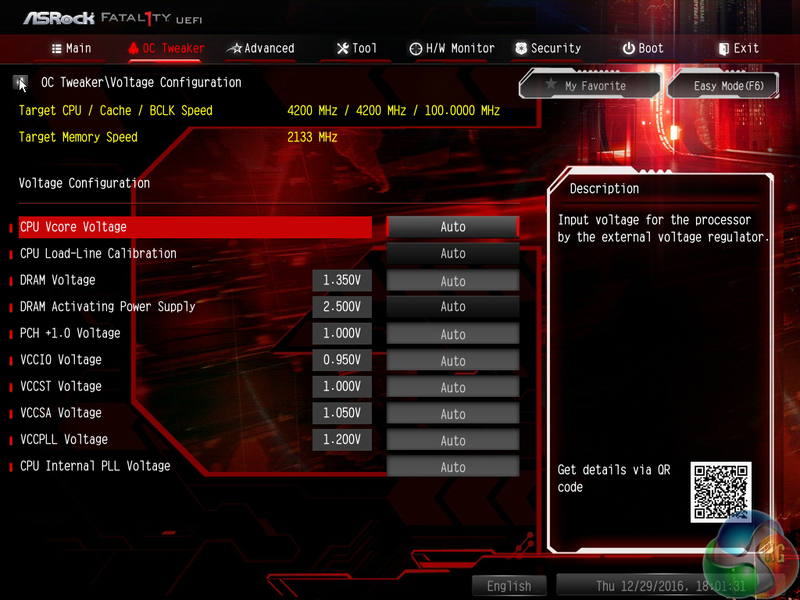 Memory: 16GB (2x8GB) G.Skill TridentZ 3200MHz 14-14-14-34 DDR4 @ 1.35V. 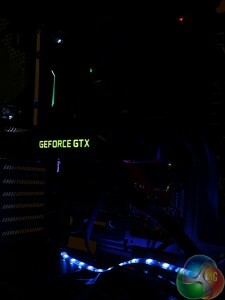 Graphics Card: Nvidia GTX Titan X Pascal (custom fan curve to eliminate thermal throttling). System Drive: 500GB Samsung 840 SATA 6Gbps SSD. Games Drive: 960GB SK Hynix SE3010 SATA 6Gbps SSD. CPU Cooler: Corsair H110i GT. Operating System: Windows 10 Pro 64-bit (Anniversary Update). 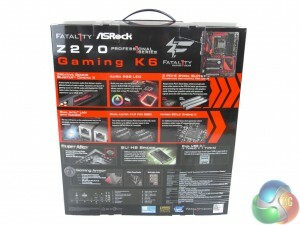 ASRock Fatal1ty Z270 Gaming K6. 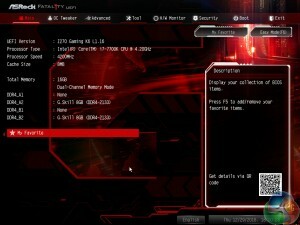 ASRock Fatal1ty Z270 Gaming K6 BIOS L1.16 (pre-release – 30/11/2016 build date). 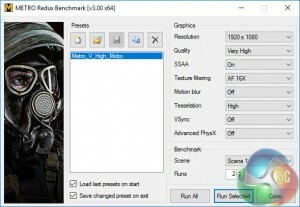 Cinebench is an application which renders a photorealistic 3D scene to benchmark a computer’s rendering performance, on one CPU core, all CPU cores or using the GPU. We run the test using the all core CPU mode. SiSoft Sandra 2016 is a multi-function utility program that supports remote analysis, benchmarking and diagnostic features for PCs, servers, mobile devices and networks. We run the application’s processor arithmetic test to gauge the CPU performance on each tested motherboard. Handbrake is a free and open-source video transcoding tool that can be used to convert video files between different codecs, formats and resolutions. We measured the average frame rate achieved for a task of converting a 6.27GB 4K video using the Normal Profile setting and MP4 container. 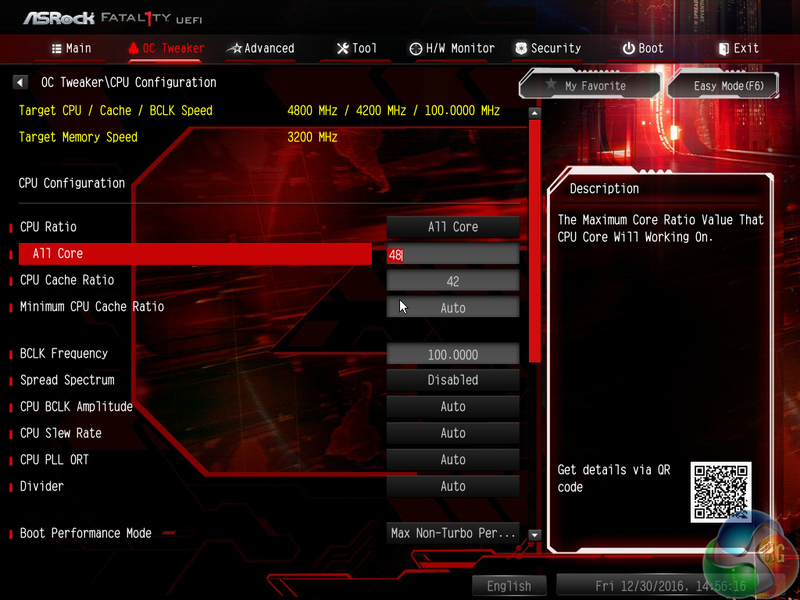 The test stresses all CPU cores to 100% and shows an affinity for memory bandwidth. ASRock’s Fatal1ty Z270 Gaming K6 makes an excellent start in the CPU-related performance benchmarks. 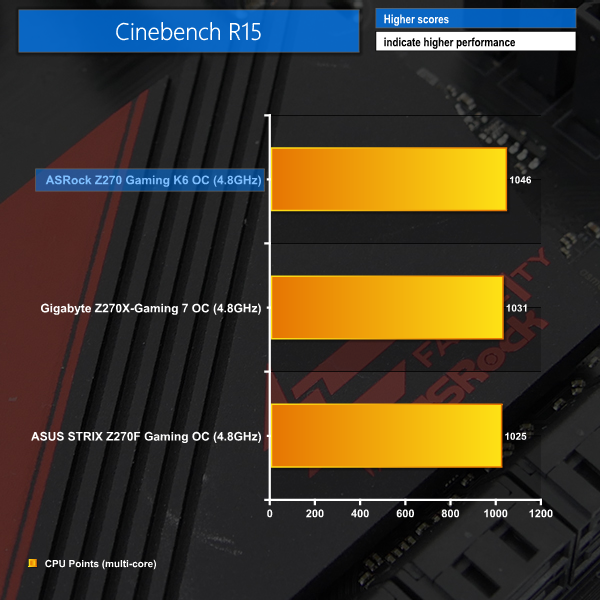 Top place is taken in all three of the tests and the gap in Cinebench performance is not insignificant (plus it’s consistent after being confirmed by many repeated runs). SiSoft Sandra 2016 is a multi-function utility program that supports remote analysis, benchmarking and diagnostic features for PCs, servers, mobile devices and networks. 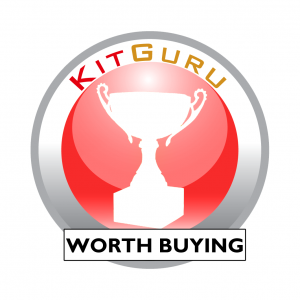 We use the SiSoft Sandra memory bandwidth test to provide a set of memory bandwidth results. 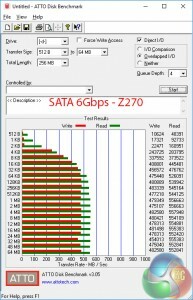 A good memory bandwidth result leads to a positive outcome for the 7-Zip benchmark. ASRock looks to have a good performance profile with the pre-release BIOS that we used for testing. 3DMark is a multi-platform hardware benchmark designed to test varying resolutions and detail levels of 3D gaming performance. 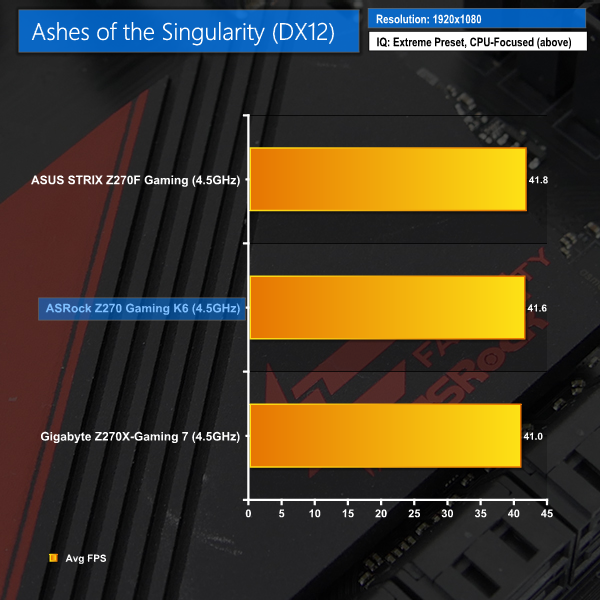 We run the Windows platform test and in particular the Fire Strike benchmark, which is indicative of high-end 1080p PC Gaming. Ashes of the Singularity is a Sci-Fi real-time strategy game built for the PC platform. 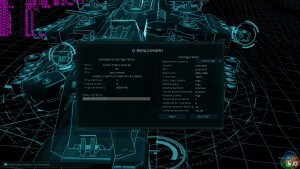 The game includes a built-in benchmark tool and was one of the first available DirectX 12 benchmarks. 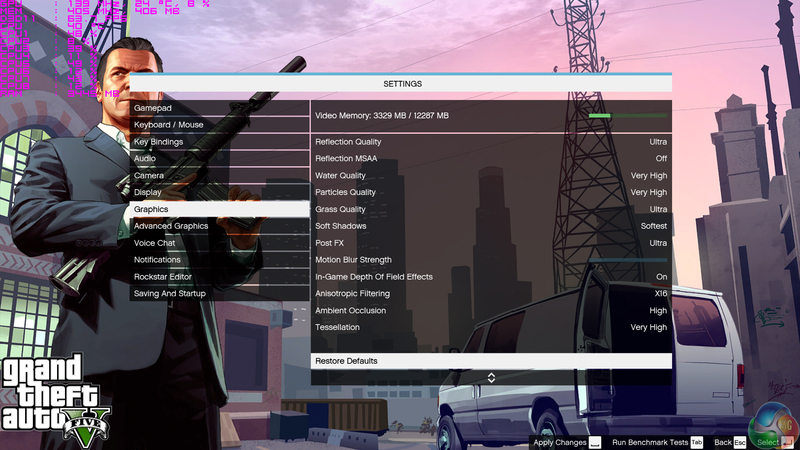 We run the CPU-focused benchmark using DirectX 12, a 1080p resolution and the Extreme quality preset. Grand Theft Auto V remains an immensely popular game for PC gamers and as such retains its place in our test suite. 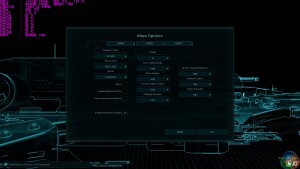 The well-designed game engine is capable of providing heavy stress to a number of system components, including the GPU, CPU, and Memory, and can highlight performance differences between motherboards. We run the built-in benchmark using a 1080p resolution and generally Maximum quality settings (including Advanced Graphics). Despite its age, Metro: Last Light Redux remains a punishing title for modern computer hardware. We use the game’s built-in benchmark with quality set to Very High, SSAA enabled, AF 16X, and High tessellation. 3DMark Fire Strike’s Physics test gives ASRock another victory but in actual gaming, the Z270 Gaming K6 is demoted to second place by virtue of ASUS’ marginally higher frame rates. 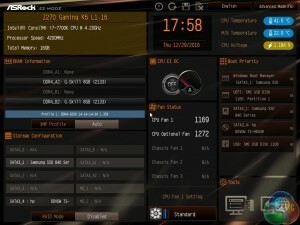 ASrock includes CPU overclocking presets for 4.6GHz, 4.7GHz, 4.8GHz, 4.9GHz, and 5.0GHz. 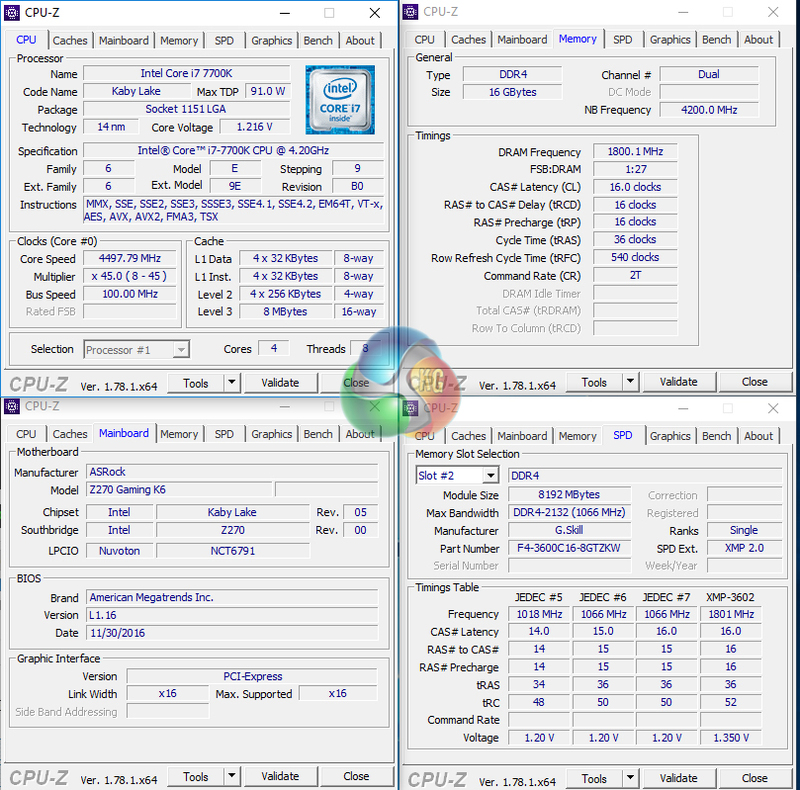 4.6GHz uses a 1.35V CPU VCore and no AVX offset. 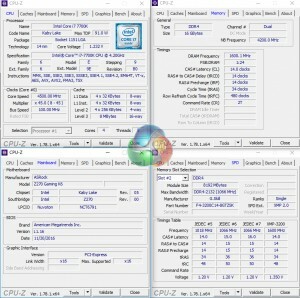 4.8GHz uses a 1.380V VCore and a -2x multiplier AVX offset. 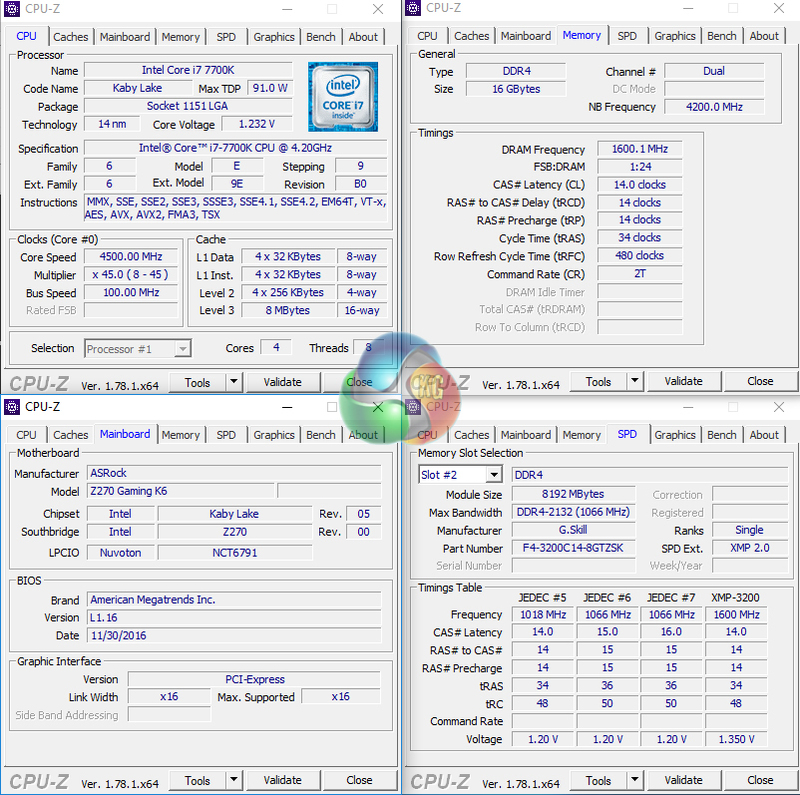 5.0GHz uses a very high 1.45V CPU VCore and a -3x multiplier AVX offset. We tested stability with the 4.8GHz preset and found it to be solid. A good cooler will be required to manage the 1.38V CPU VCore. As the screenshot shows, Prime 95 AVX workload drops the CPU clock speed by two multipliers down to 4.6GHz. 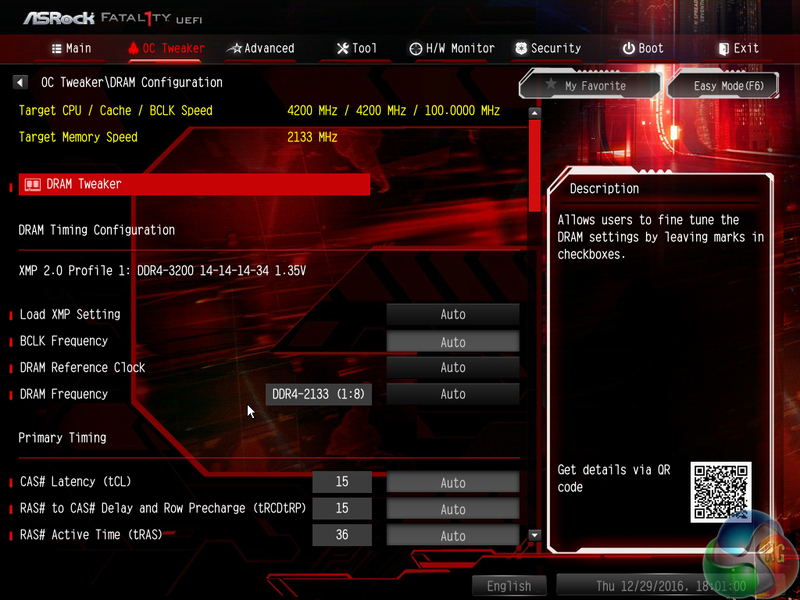 I am pleased to see that XMP is left enabled with the CPU overclocking presets. 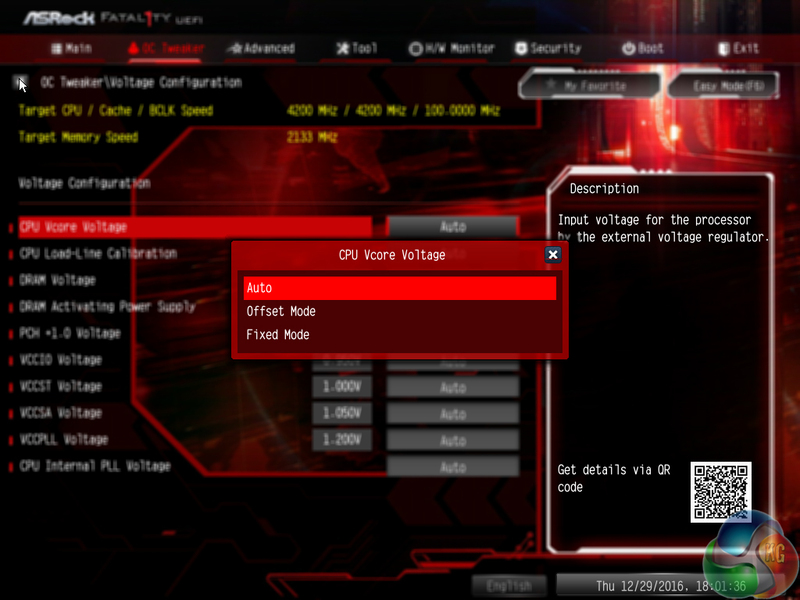 To test the ASRock Fatal1ty Z270 Gaming K6 motherboard’s CPU overclocking potential, we first increased the CPU VCore to 1.35V and applied Level 1 LLC setting in order to minimise voltage adjustments above or below the desired level. We maintained the DRAM frequency at 3200MHz to take its stability out of the overclocking equation. Cache frequency was manually set at its stock MCT value of 4.2GHz as the ASRock board had a tendency to increase the cache speed to 4.6GHz or 4.8GHz when the Auto setting was applied. 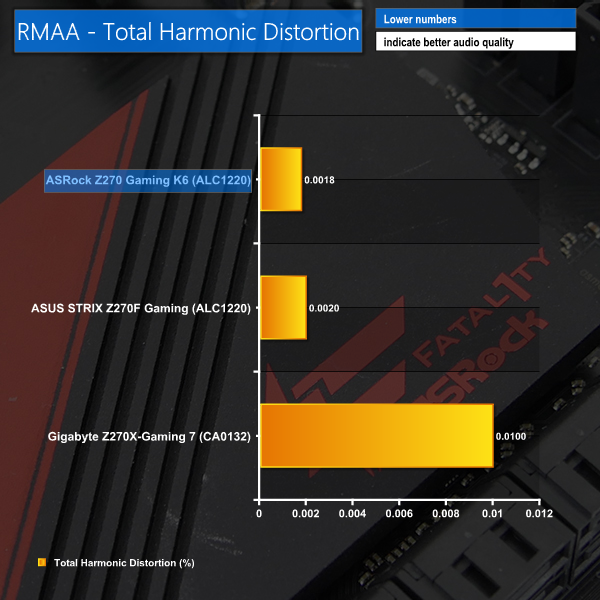 We took our 7700K to its Prime-stable maximum frequency of 4.8GHz. This used a 1.35V BIOS-set VCore and the Level 1 LLC mode which saw the CPU VCore drop by only 6mV under heavy load. This level of voltage accuracy is superb. 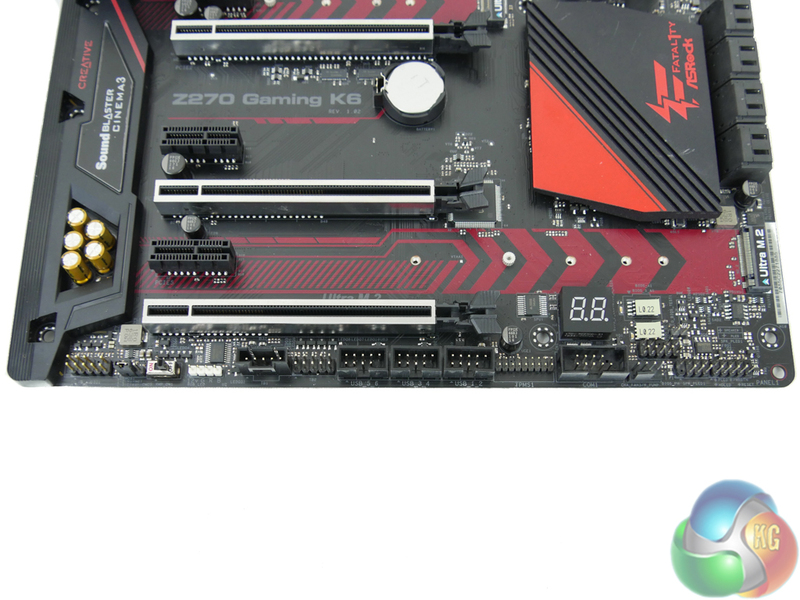 We test the motherboard’s ability to run G.Skill’s high-speed 16GB DDR4 TridentZ kit at a 3600MHz XMP setting. 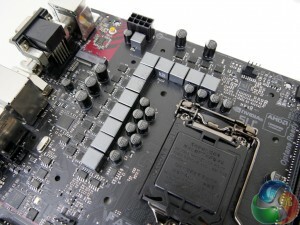 High-speed XMP settings can prove a challenge for motherboard designers when optimising the settings for stability at the intended DRAM frequency. 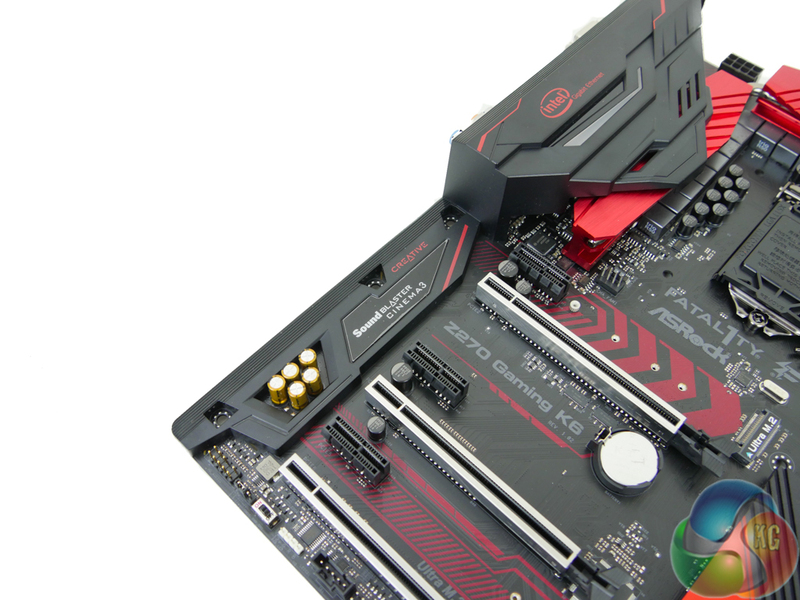 As a performance comparison, we have included the results from two other Z270 motherboards. The maximum overclocked configuration achieved with each board was a 4800MHz (48 x 100MHz) processor frequency whilst using 3200MHz CL14 memory. 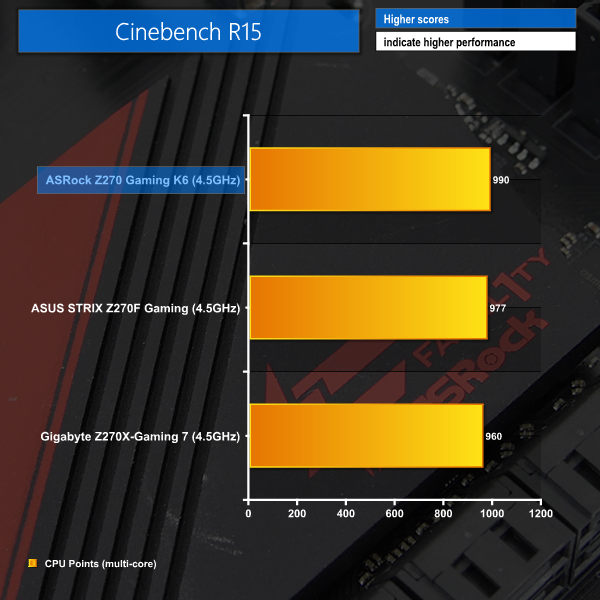 After being overclocked to 4.8GHz, ASRock’s Fatal1ty Z270 Gaming K6 maintains its top spot in CPU-heavy benchmarks and manages to gain the first position in gaming tests. We leave the system to idle on the Windows 10 desktop for 5 minutes before taking a reading. For CPU load results we run AIDA64 CPU, FPU, and Cache stress tests and take a reading. The power consumption of our entire test system (at the wall) is shown in the chart. The 1.232V Stock MCT VCore results in positive power draw numbers for ASRock. 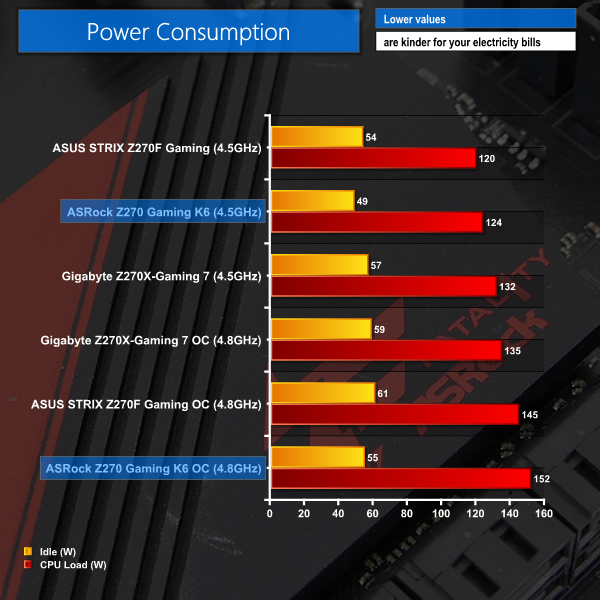 A load system-wide power draw of 124W shows good efficiency and is only bested by ASUS’ STRIX Z270F Gaming. Idle numbers are also positive thanks to the ability of ASRock’s hybrid digital controller to drop the CPU core voltage under low-load conditions. Overclocked power draw is the worst of these three contenders, likely due to ASRock’s ability to hold close to 1.35V (unlike Gigabyte’s) while also powering add-on chipsets for USB 3.0 and SATA (unlike ASUS). Put simply, the Z270 Gaming K6 is likely to draw a little more power from your system than ASUS’ STRIX Z270F Gaming, even when both use the same BIOS-set CPU VCore levels. 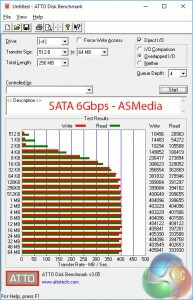 The ATTO disk benchmark is a Windows-based utility for testing storage performance of any storage drive or controller. 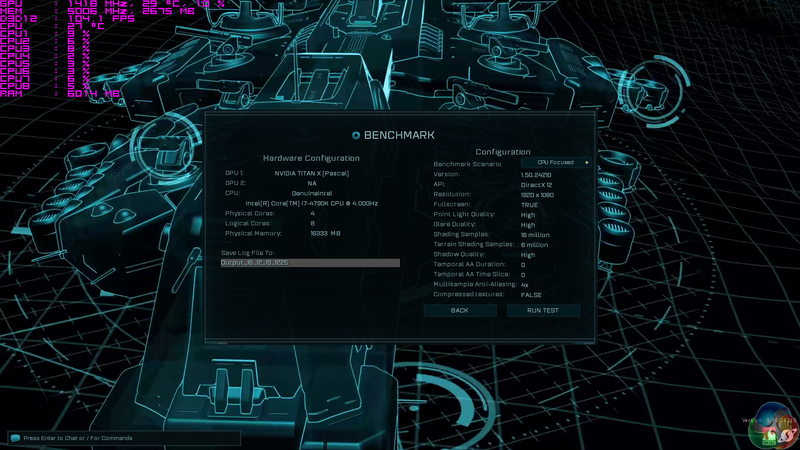 We use the default benchmark setup. For M.2 testing we use a Toshiba OCZ RD400 256GB M.2 PCIe NVMe SSD. M.2 PCIe performance is adequate for preventing bottlenecking with the market’s leading M.2 SSDs. With that said, the lower slot position was susceptible to thermal throttling from the SSD in our open-air test conditions. The upper-slot received airflow from the nearby CPU cooler and was able to prevent SSD thermal throttling. In a chassis environment with decent airflow, the thermal throttling difference between either slot is likely to be less glaring. 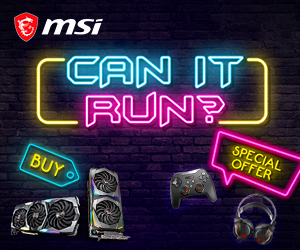 But it is certainly something to consider when building your system, especially when competing offerings from MSI and ASUS have M.2 cooling solutions. 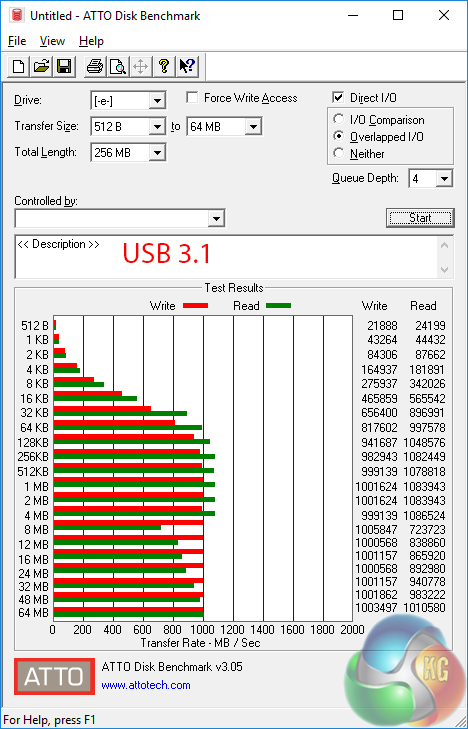 We test USB 3.1 performance using a pair of Corsair Force LE 120GB SSDs in RAID 0 connected to an Icy Box RD2253-U31 2-bay USB 3.1 enclosure powered by an ASMedia ASM1352R controller. 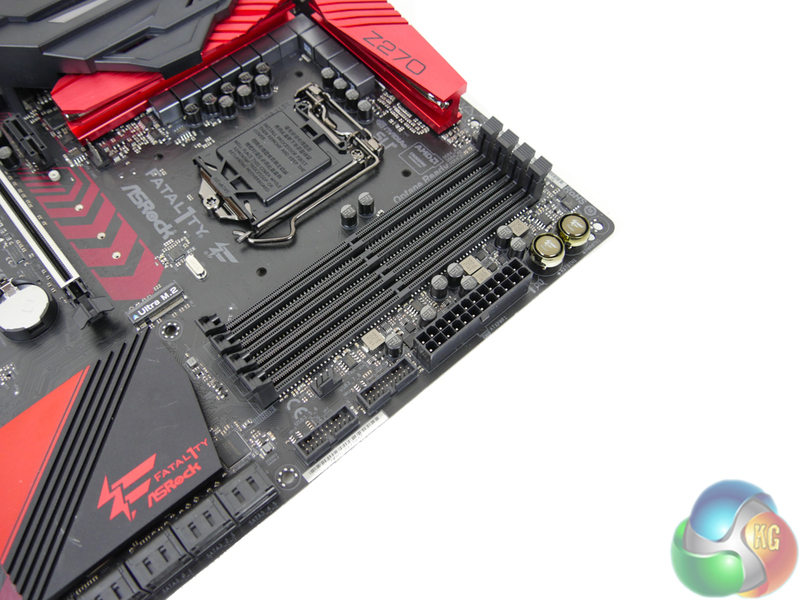 Over 1000MBps is possible using the ASRock board’s ASM2142-powered USB 3.1 ports. 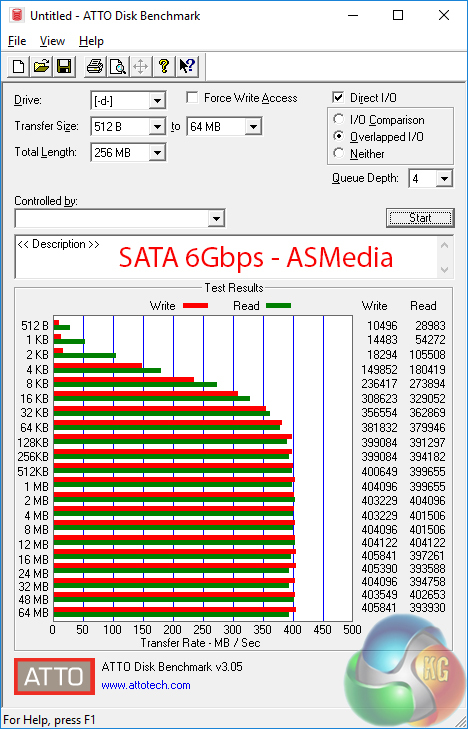 For SATA 6Gbps testing we use a SK Hynix SE3010 960GB SSD. 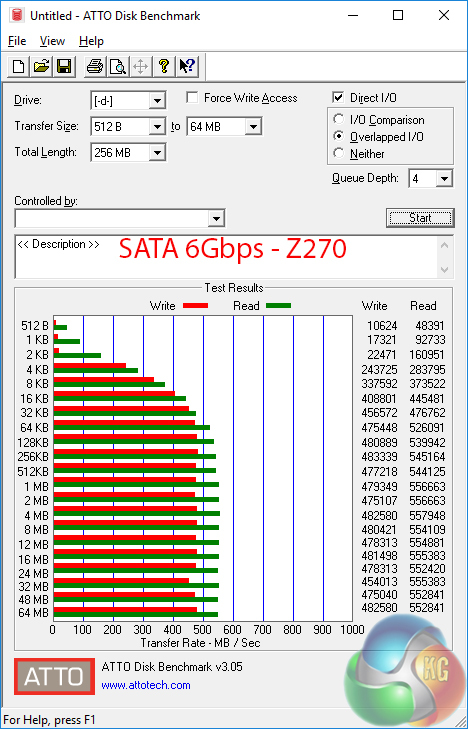 Speed from the Z270 SATA ports leaves no cause for concern. The ASM1061-powered ports are slow and should only be used for mechanical storage when no Z270 ports are available. 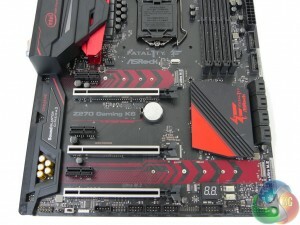 I do, however, like ASRock’s decision to include additional SATA ports; a pair of M.2 SSDs will steal bandwidth from a total of four Z270 SATA ports, leaving the ASM chipset as a good solution for extending the number of options for mass storage. 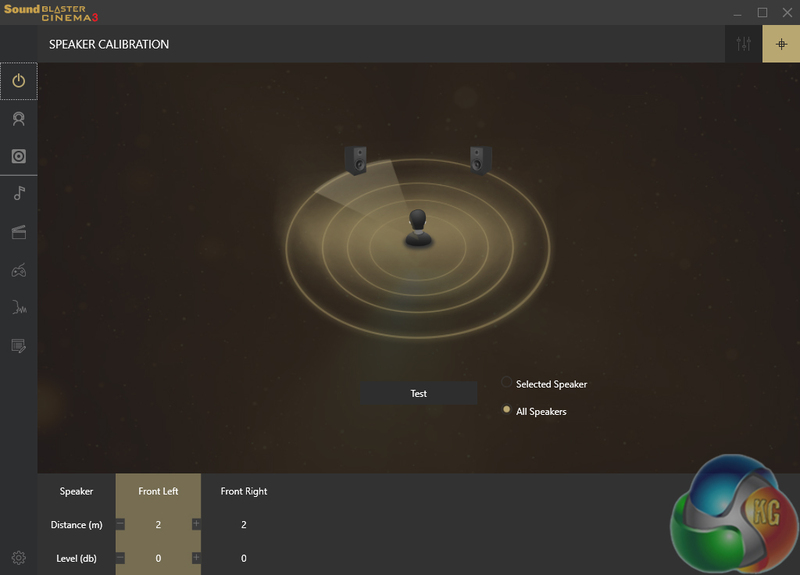 Rightmark Audio Analyser is a freeware benchmarking utility designed to objectively test the performance characteristics of audio solutions. We setup a line-in line-out loop and execute the record/playback test before generating the results report you see below. A sampling mode of 24-bit, 192 kHz was tested. Audio performance from the ALC1220-powered solution is Very Good according to Right Mark Audio Analyzer. 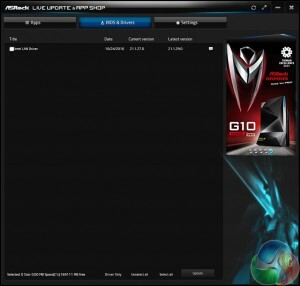 Gigabyte’s solution makes for a difficult comparison as it uses a completely difference Creative chipset. 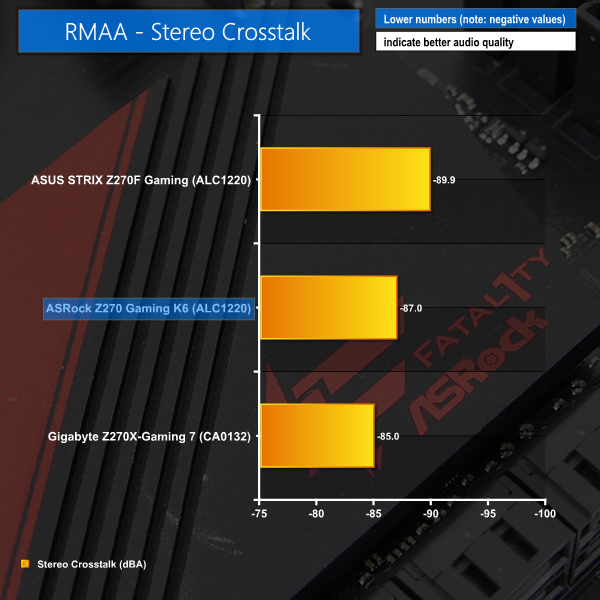 However, ASUS’ STRIX Z270F Gaming uses the same ALC1220 codec but generally offers slightly better performance than ASRock’s Z270 Gaming K6. This is likely due to the different strategy for audio capacitors and codec shielding. 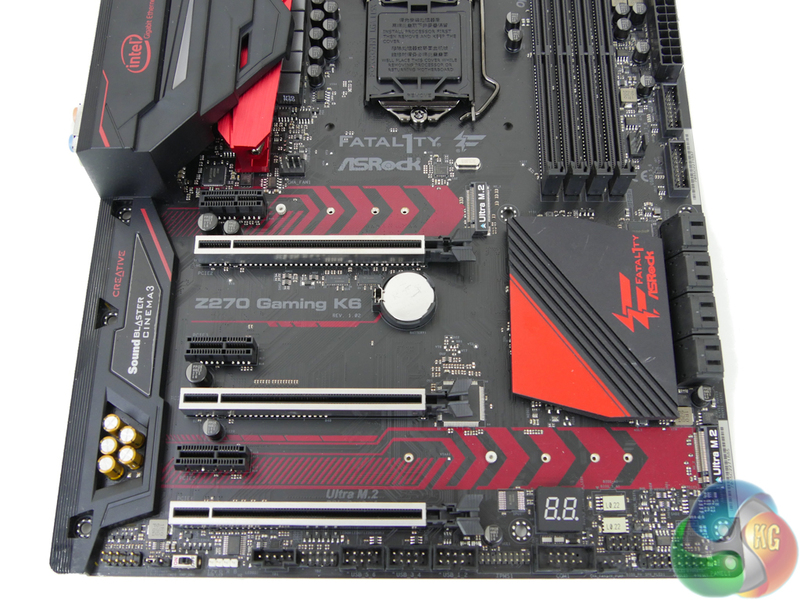 The ASRock Fatal1ty Z270 Gaming K6 is a very good mid-range offering that provides a host of features and currently has a well-tuned BIOS profile which gives it a performance advantage against our ASUS and Gigabyte comparison solutions. 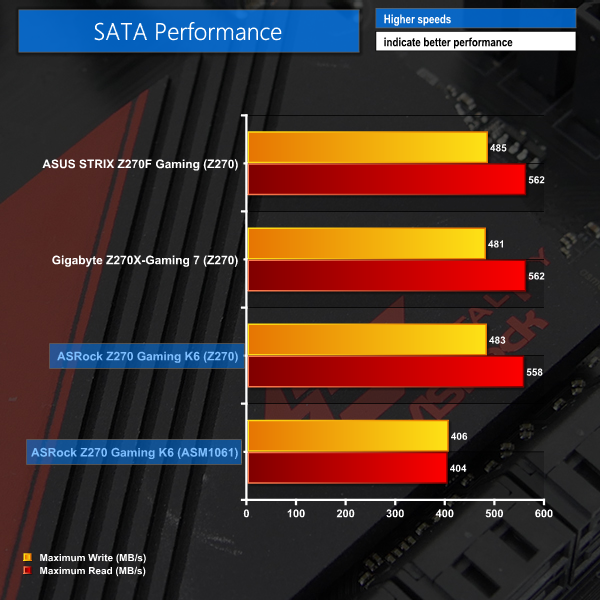 ASRock’s performance is superb throughout testing, with the Z270 Gaming K6 leading more charts than it doesn’t. Manual overclocking was simple and the board’s voltage accuracy was superb thanks to well-designed and clear LLC settings. The power delivery system seemed to do a good job despite not being being a fully digital operation. Motherboard layout is superb and the inclusion of small add-ons, such as a second USB 3.0 internal header and two additional SATA 6Gbps ports, enhances the premium feel of the Z270 Gaming K6. 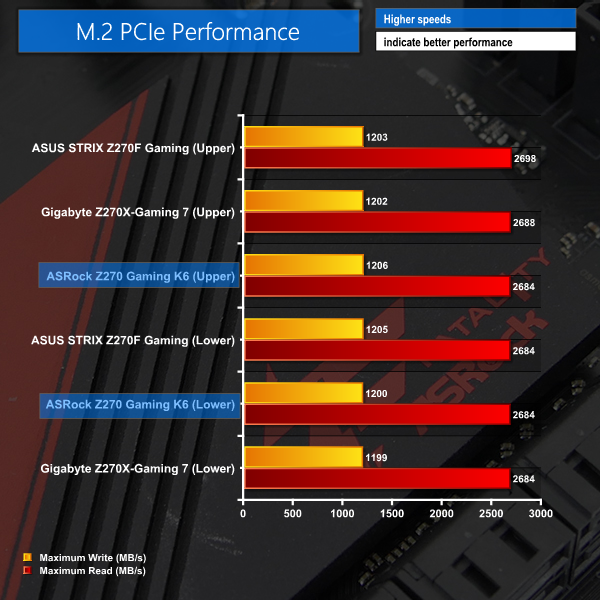 I am, however, disappointed to see no consideration given to M.2 cooling as competing vendors such as MSI and ASUS have clearly done. With that said, the ability to run dual PCIe M.2 SSDs alongside a pair of CrossFire/SLI graphics cards shows good thought for lane distribution. The colour scheme is consistent and should appeal to users who like the red and black style. RGB LEDs are situated in three individual zones, with the option to add an external strip using the 4-pin AURA header. 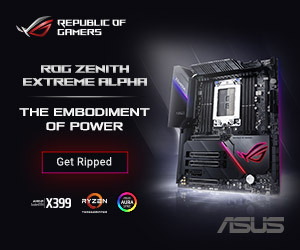 The onboard RGBs are, however, of limited use as they are barely visible and quite dim (especially beneath the chipset). This may appeal to some but if you want clearly visible RGB LEDs, you will need to purchase an external strip to use with this board. I like ASRock’s UEFI thanks to its ease-of-navigation, superb fan control abilities, and inclusion of smart tools such as System Browser. Other than the basic overclocking presets that only had mediocre optimisation, I don’t really have any complaints for the UEFI. The OS software tools are limited and are nowhere near as good as the options provided by ASUS, Gigabyte, and MSI. 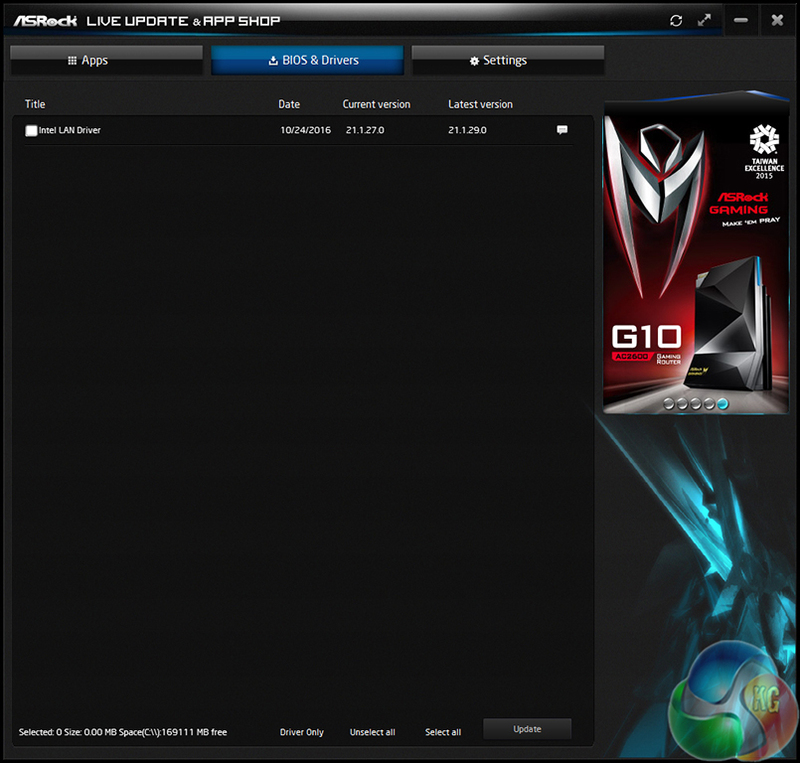 It is, however, likely that ASRock will improve the variety of software tools available via updates following release. 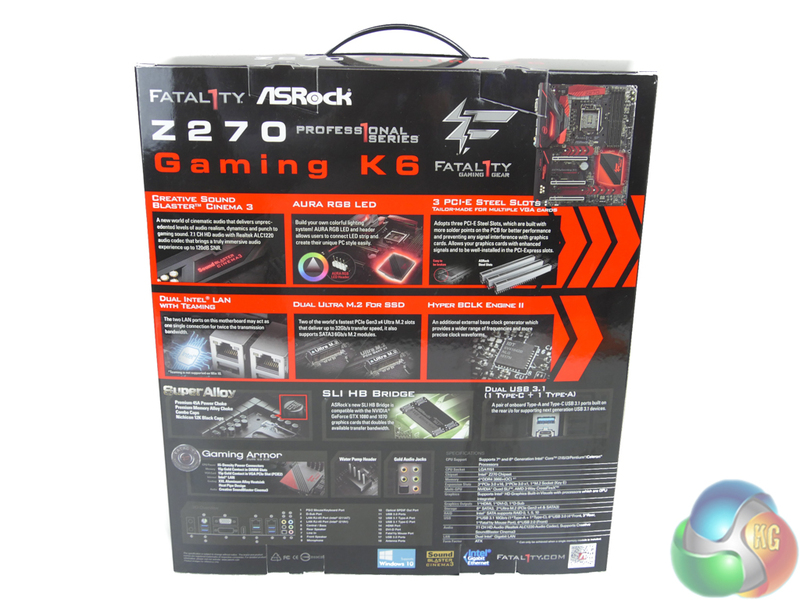 The ASRock Fatal1ty Z270 Gaming K6 is available at Overclockers UK for £189.95. A smart selection of features, solid UEFI, and good performance make the Gaming K6 a clear option for mid-range Z270 buyers. No 4K60-capable display output is disappointing and the onboard RGB LEDs are not great but there is an AURA RGB header to compensate for that. Great performance despite the early pre-release BIOS used for testing. 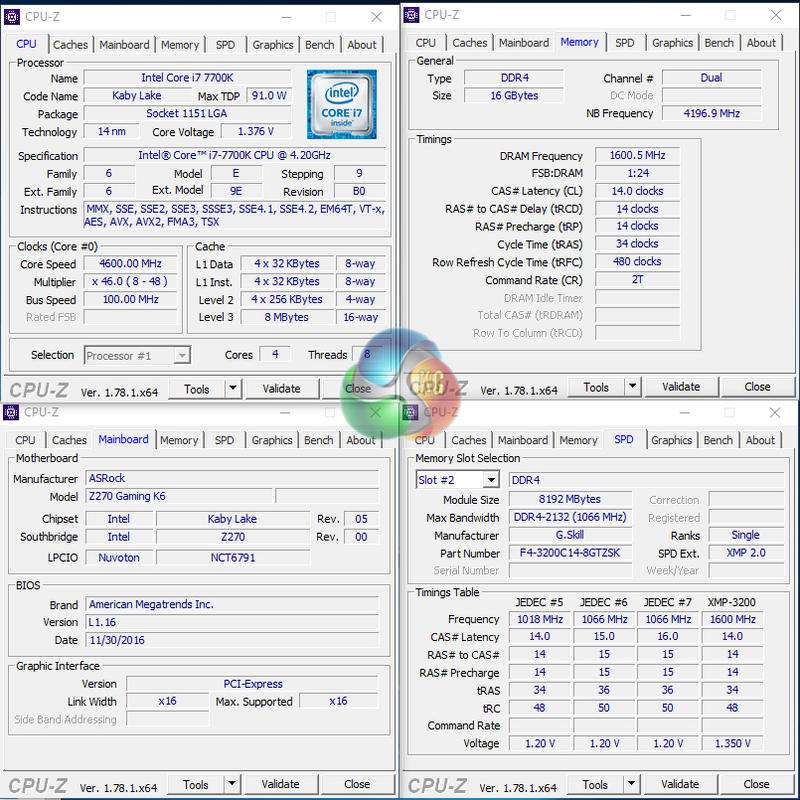 Good overclocking capability with superb voltage accuracy thanks to smart, clear LLC profiles. 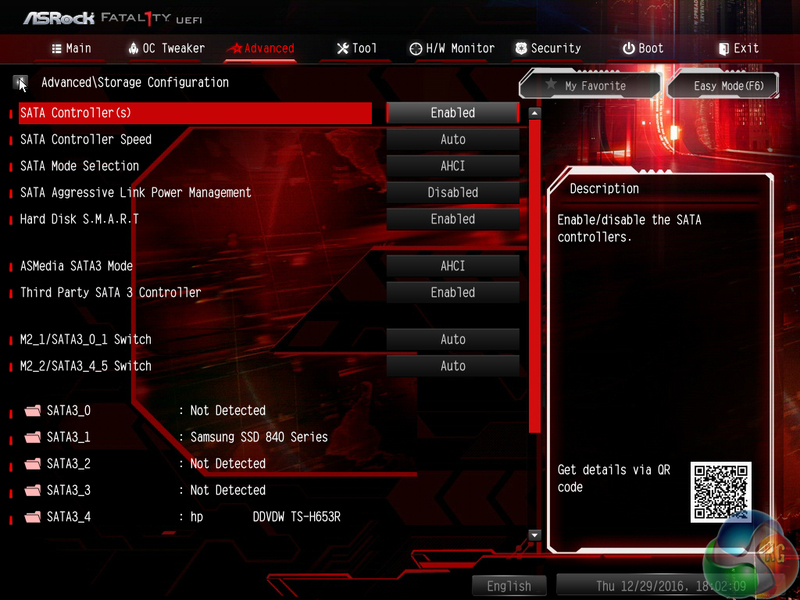 Excellent UEFI design with superb fan control abilities. Smart lane distribution decisions – dual M.2 PCIe SSDs alongside a pair of SLI/CrossFire graphics cards is possible. Small add-ons combine to make a good impact – M.2 Key E for a WiFi card, two more SATA 6Gbps ports, additional USB headers. Onboard buttons and 2-digit LED are good for diagnostics (in addition to the UEFI System Browser). 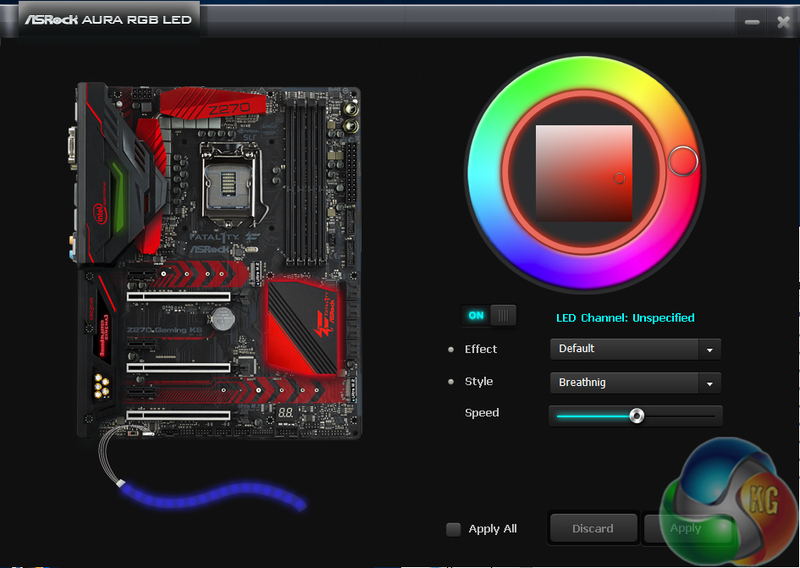 Limited light from the RGB LEDs and the AURA RGB LED tool cannot control partnering hardware such as graphics cards. No M.2 SSD cooling solution or U.2 connector like competing products offer. Mediocre CPU overclocking presets and no good automated tuning method. 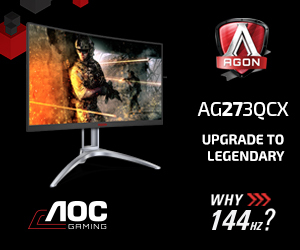 No high-resolution 60Hz-capable display output onboard (no DisplayPort or HDMI 2.0). 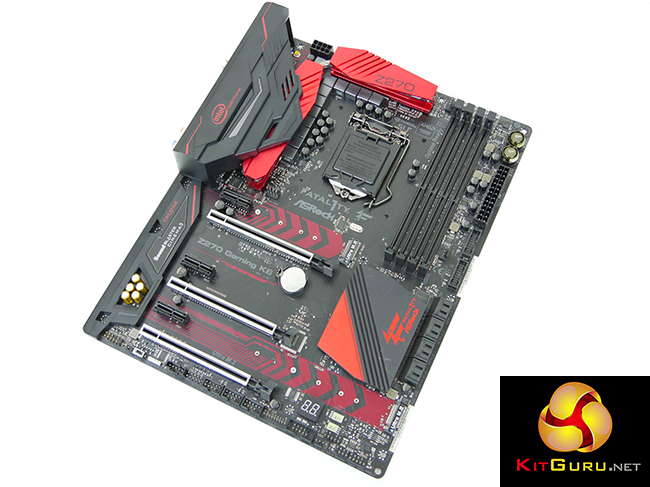 KitGuru says: A great feature set, very good performance, and a strong UEFI implementation make the ASRock Fatal1ty Z270 Gaming K6 a smart choice.